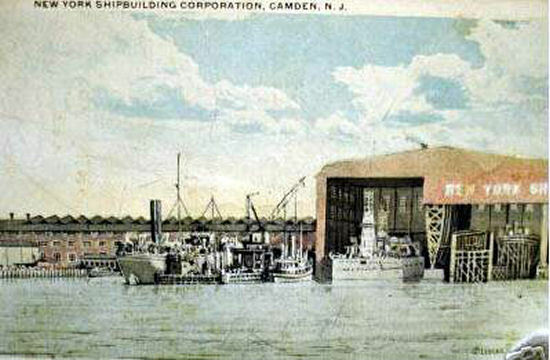 Operational and Building Data: Laid down by New York, Shipbuilding, Camden, NJ., December 17, 1906. Launched May 26 1908. Commissioned January 4, 1910. Decommissioned February 11, 1922. Stricken November 10, 1923. Fate: Broken up for scrap at the Philadelphia Naval Ship Yard during 1924. 364k Port side view of a model of the South Carolina (BB-26) at US Navy's Modeling Basin in VA. Courtesy of Mike Ley. 3.02k THE ALL-BIG-GUN BATTLESHIPS SOUTH CAROLINA (BB-26) AND MICHIGAN (BB-27). First picture ever made of these remarkable ships. Image and text provided by Library of Congress, Washington, DC. Photo from New-York Tribune. (New York [N.Y.]) 1866-1924, 13 January 1908, Image 3, via chroniclingamerica.loc.gov. 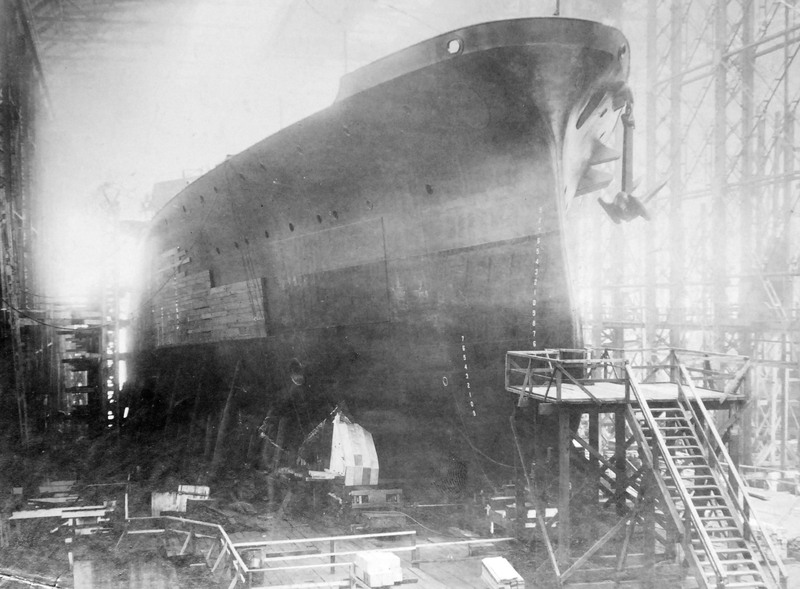 428k Michigan (BB-27) under construction at New York Shipbuilding Corporation, New York, probably 1908. Photo # Lot-10778-1 courtesy of National Museum of the U.S. Navy. George C. Bain Collection. Courtesy of the Library of Congress. 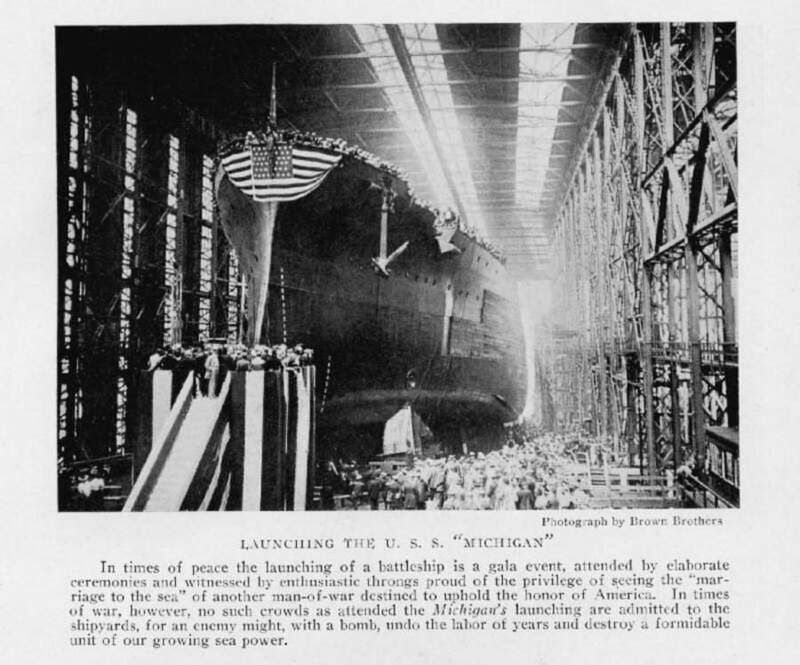 90k "In times of peace the launching of a battleship is a gala event, attended by elaborate ceremonies and witnessed by enthusiastic throngs proud of the privilege of seeing the "marriage of the sea" of another man-of-war destined to uphold the honor of America. 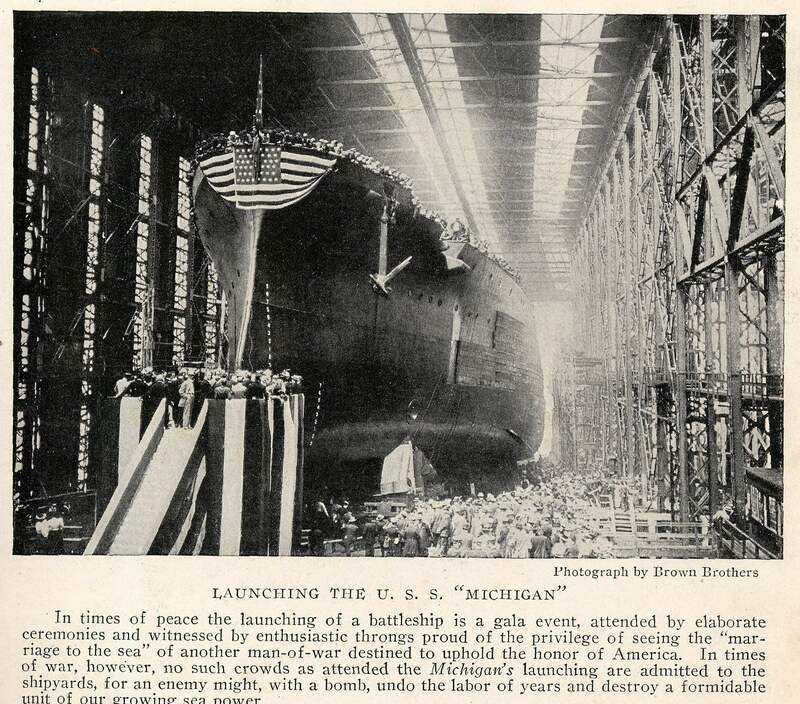 In times of war, however, no such crowds as attended the Michigan's (BB-27) launching are admitted to the shipyards, for an enemy might, with a bomb undo the labor of years and destroy a formidable unit of our growing sea power." The Michigan is pictured here on her launching day, 26 May 1908 at New York Shipbuilding Corporation, Camden, NJ. Brown Brothers photo from the book "Flags Of The World", by McCandless and Grosvenor, published in 1917 by the National Geographic Society and submitted by John Chiquoine & Image and text provided by Library of Congress, Washington, DC. Photo from New-York Tribune. (New York [N.Y.]) 1866-1924, 31 May 1908, Image 50, via chroniclingamerica.loc.gov. Hi-res photo by Paul Thompson from National Geographic, 1917 via Dan Wilmes. 2.02k Mrs. Carol Newberry to Christen the New Battleship Michigan (BB-27) at Camden, N.J., May 26. Image and text provided by Library of Congress, Washington, DC. Photo from The Washington Times. (Washington [D.C.]) 1902-1939, 13 May 1908, Last Edition, Image 6 courtesy of chroniclingamerica.loc.gov. 2.27k CHRISTENING OF NEW BATTLESHIP MICHIGAN (BB-27) RECALLS SIGNIFICANCE OF ANCIENT CUSTOM. Photo from Evening Star. (Washington, D.C.) 1854-1972, 24 May 1908, Image 52, via chroniclingamerica.loc.gov. 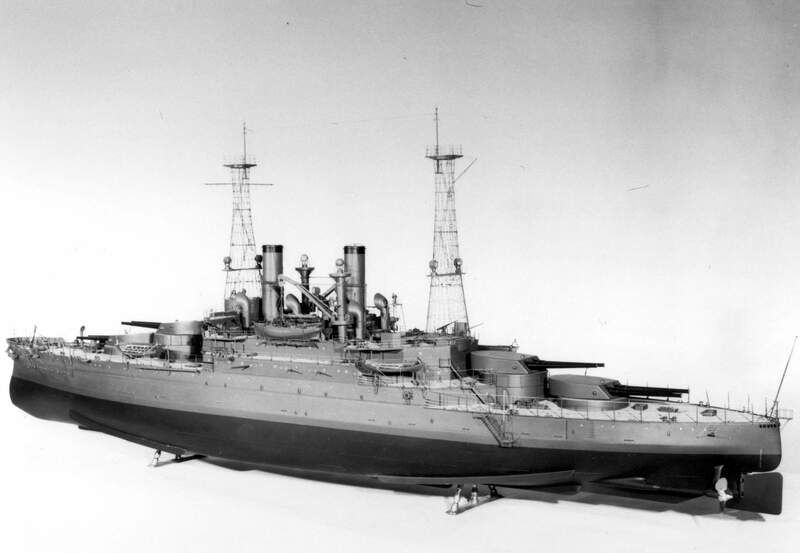 3.70k Nine page PDF of the Michigan (BB-27) on her trial runs. 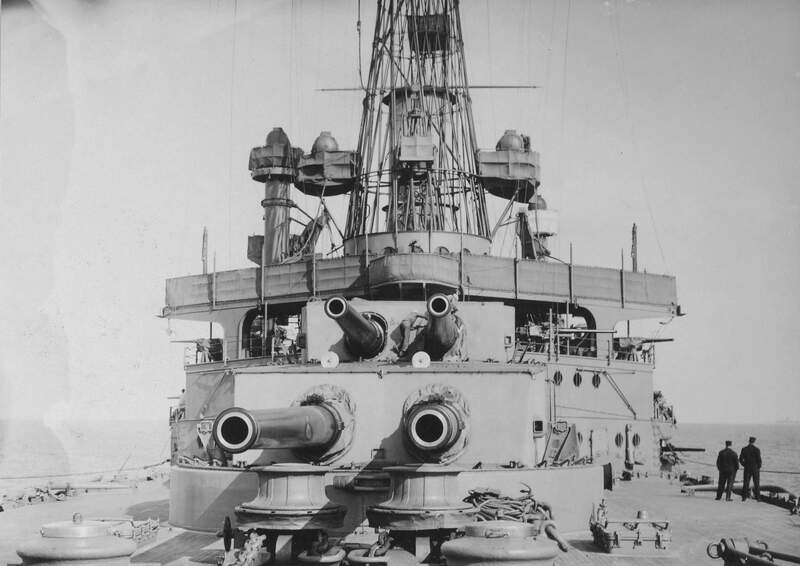 Photos clearly show the main armament layout of eight 12" rifles in four center line turrets. The Michigan and South Carolina's (BB-26) design preceded the Dreadnought's design but building delays on the two ships allowed the Dreadnought to be launched and commissioned first which diminished the South Carolina class's impact on the naval scene. 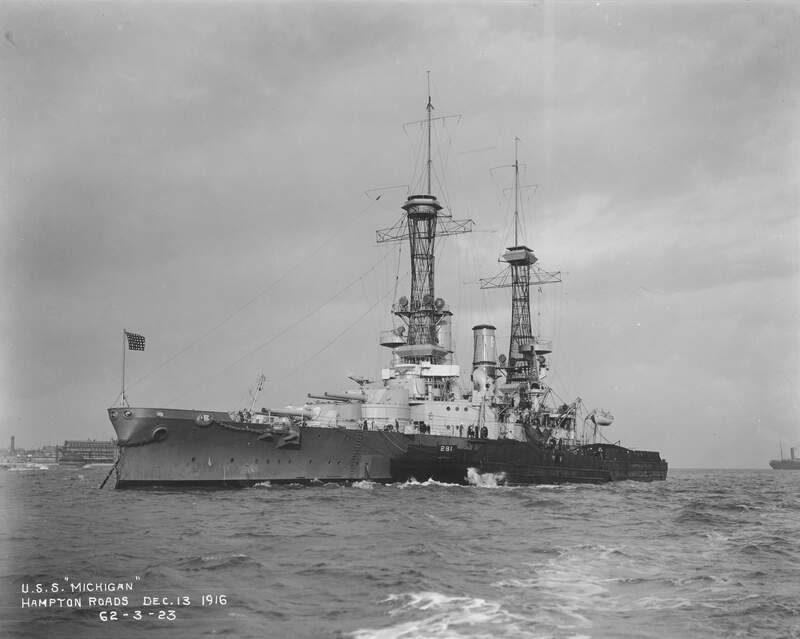 The United States ships were of a superior design combining a powerful armament on a limited displacement. Copyright by N.L. Stebbins, Boston. USN photo # 19-N-20-20-13 from National Archives and Records Administration (NARA), College Park, Maryland, courtesy of Sean Hert. 1.10k 16,000 tons of a smoky Michigan (BB-27) accompanied by a destroyer bear down on photographer Enrique Muller, most likely during her trial runs off Cape Cod in June 1909. THE MICHIGAN, FASTEST OF AMERICAN BATTLESHIPS, BREAKING SPEED RECORD ON HER TRIAL TRIP. 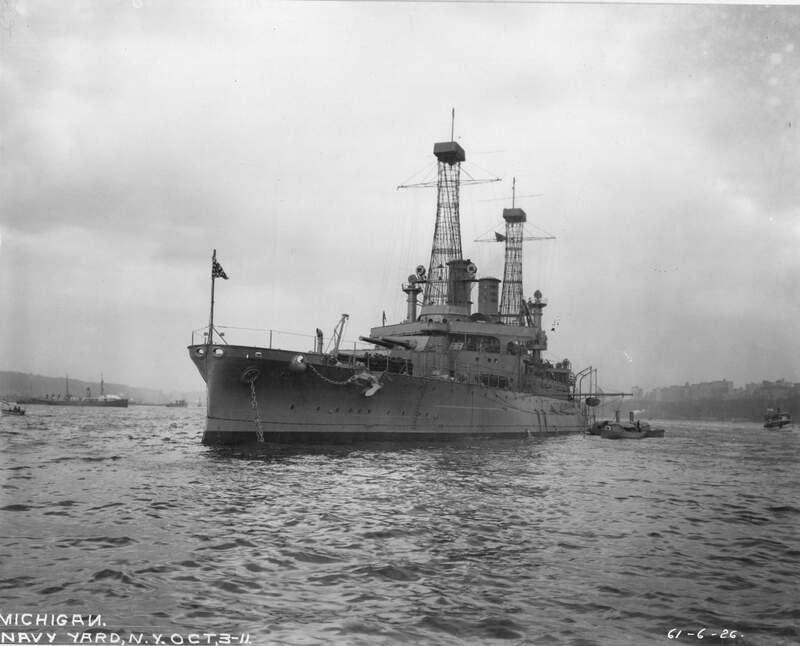 The new battleship Michigan in her tests preparatory to acceptance by the government attained a speed of 20.01 knots an hour and averaged a fraction under 19 knots an hour on a four mile run. Considering her class and the fact that only 18 knots an hour is required of her, the time she made is regarded as phenomenal. The vessel ran ashore off Cape Cod while proceeding at a high ratio of speed, but suffered no apparent injury. She then went to Camden, N. J to be overhauled for her final test, a twenty-four hour run at top speed. It is believed that the Michigan will establish a new world's record for the "twenty-four hour run. She is fitted with two of the new skeleton masts recently adopted by the Navy. Image and text provided by Ohio Historical Society, Columbus, OH. Photo from The Marion Daily Mirror. (Marion, Ohio) 1892-1912, 17 June 1909, Image 1, courtesy of chroniclingamerica.loc.gov. USN photo by Enrique Muller. 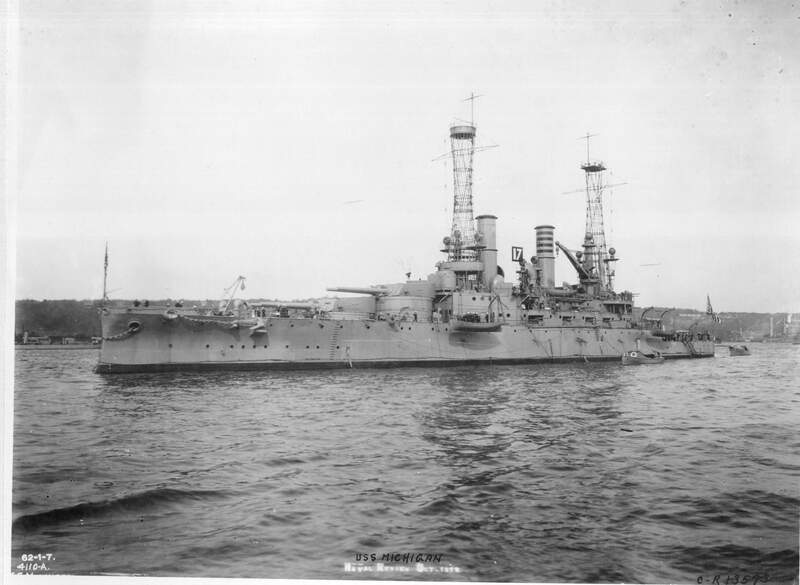 373k Michigan (BB-27) on 30 June 1909. USN photo # 19N-141029 from National Archives and Records Administration (NARA), College Park, Maryland, courtesy of Sean Hert. 362k Michigan (BB-27) at Navy Yard, Philadelphia, PA. on 16 November 1909. USN photo # 19-N-20-20-20 from National Archives and Records Administration (NARA), College Park, Maryland, courtesy of Sean Hert. 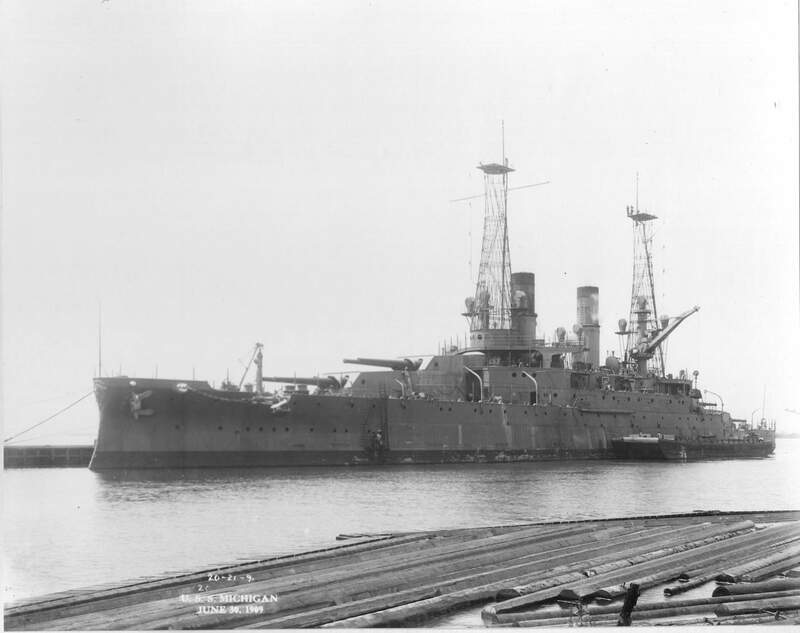 348k Michigan (BB-27) at Navy Yard, Philadelphia, PA. on 16 November 1909. USN photo # 19-N-141029 from National Archives and Records Administration (NARA), College Park, Maryland, courtesy of Sean Hert. 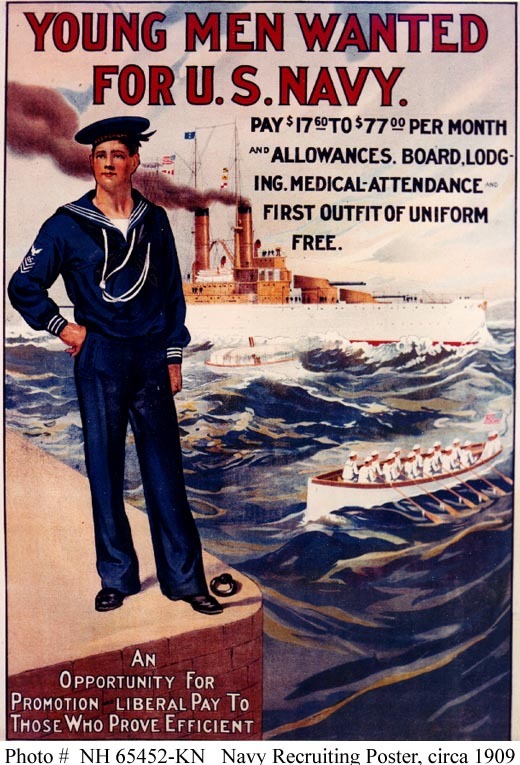 118k Navy Recruiting Poster, circa 1909. 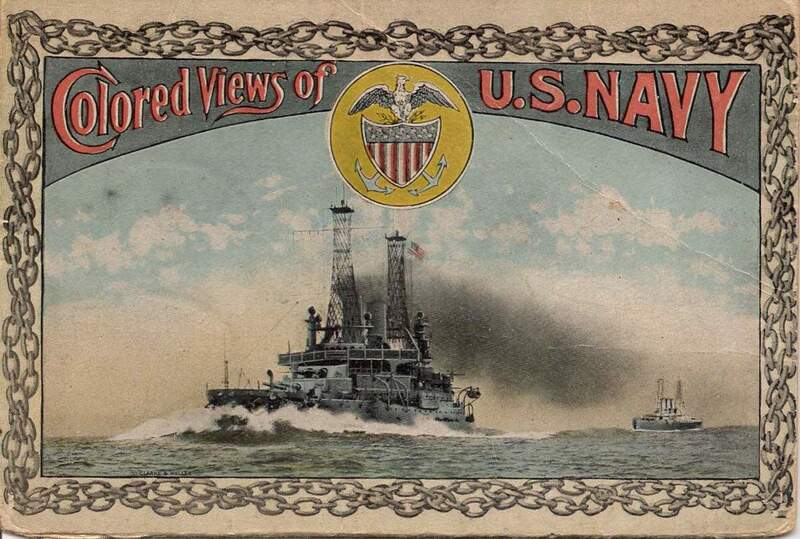 Poster featuring a sailor, a South Carolina class battleship, small craft and details on pay and benefits, published about 1909. USNHC # NH 65452-KN. 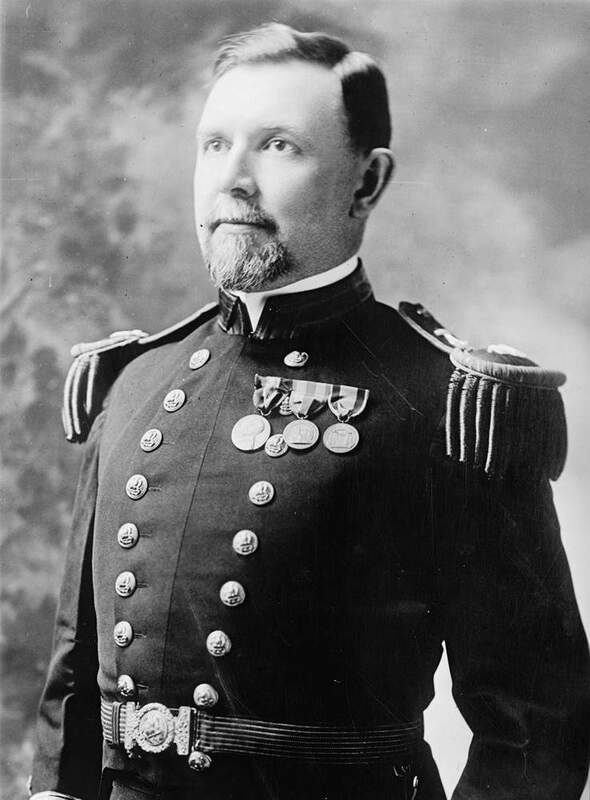 66k Nathaniel Reilly Usher, first Captain of the Michigan (BB-27)	[04.01.1910} Photo courtesy of the Library of Congress & submitted by Bill Gonyo. 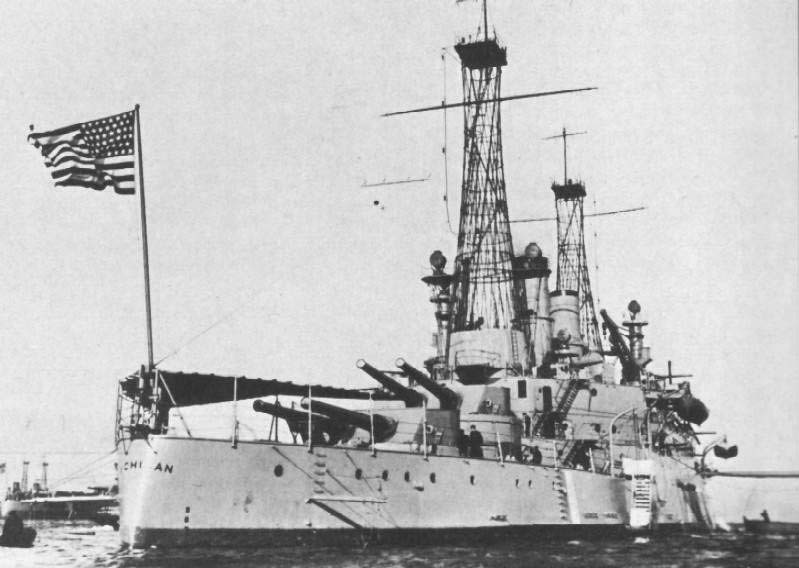 350k Michigan (BB-27) circa 1910. USN photo # 19N-13702 from National Archives and Records Administration (NARA), College Park, Maryland, courtesy of Sean Hert. The Navy Department is elated over the sensational record in marksmanship made by the crew of the warship Michigan in the spring tests. 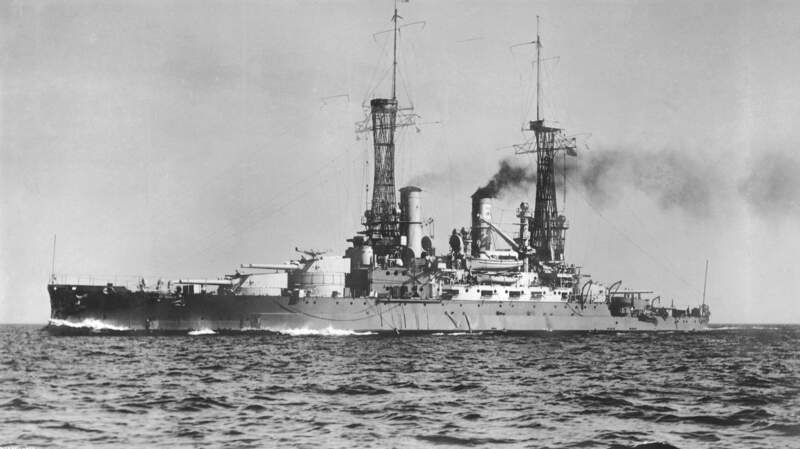 According to the official records just made public, the battleship Michigan's men outclassed all the other bluejackets of the navy in target work with the big guns. The men in the picture are some of the sailors who helped to win the trophy for the Michigan. In honor of their victory that ship is now entitled to fly at her masthead a red pennant with a black ball in the center, and she will fly the bunting until another vessel does some shooting good enough to take the championship away from her. The navy department's figures give the Michigan 99.929 % of merit. Image and text provided by University of Florida. Photo courtesy of The Pensacola Journal. (Pensacola, Fla.) 1898-1985, 03 June 1911, Image 8, via chroniclingamerica.loc.gov. Insert PDF Image and text provided by State Historical Society of Iowa. Photo from Evening Times-Republican. (Marshalltown, Iowa) 1890-1923, 19 August 1911, Image 2, courtesy of chroniclingamerica.loc.gov. 268k Michigan (BB-27), sailors on deck, 13 July 1911. Photo courtesy of Library of Congress, Photo # LC-B2-2008-4A [P&P] LOT 10778 George C. Bain Collection, via Mike Green. 518k Results of War Game Held by Uncle Sam Will Be Kept Secret From Foreign Naval Experts. 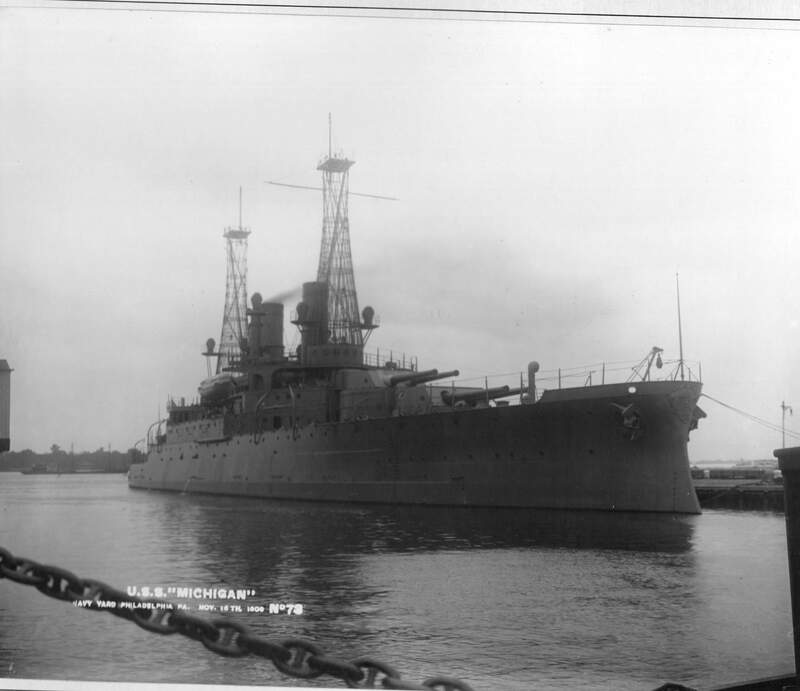 The above picture shows the fore deck of the battleship Michigan (BB-27), one of the score of battleships which comprised the great fleet which participated in the war game of attacking and defending the Atlantic coast. The rival forces did splendid work, for which their commanders praised them in reports to Washington. 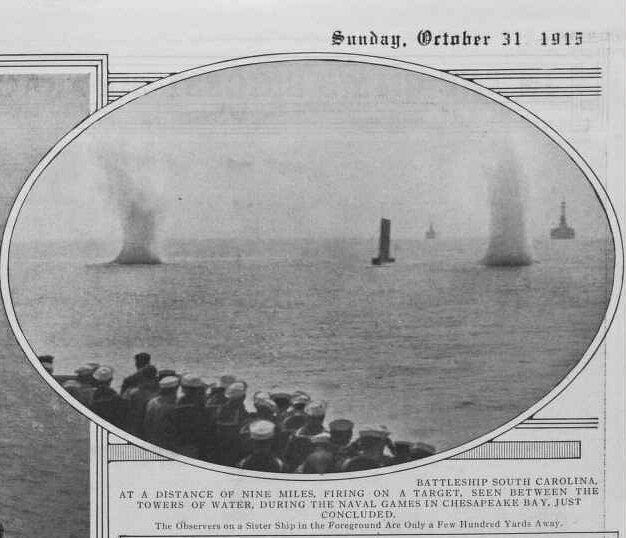 While in the newspaper dispatches victory was claimed for both sides, whether the attacking battleships were theoretically sunk or the defending craft destroyed will never be made public, as the naval strategy board believes the information would be too valuable to foreign naval experts. Photo copyright by American Press Association. 1911. Photo & text by The Logan Republican. (Logan, Utah) 1902-1924, 08 August 1911, Image 1, courtesy of chroniclingamerica.loc.gov. 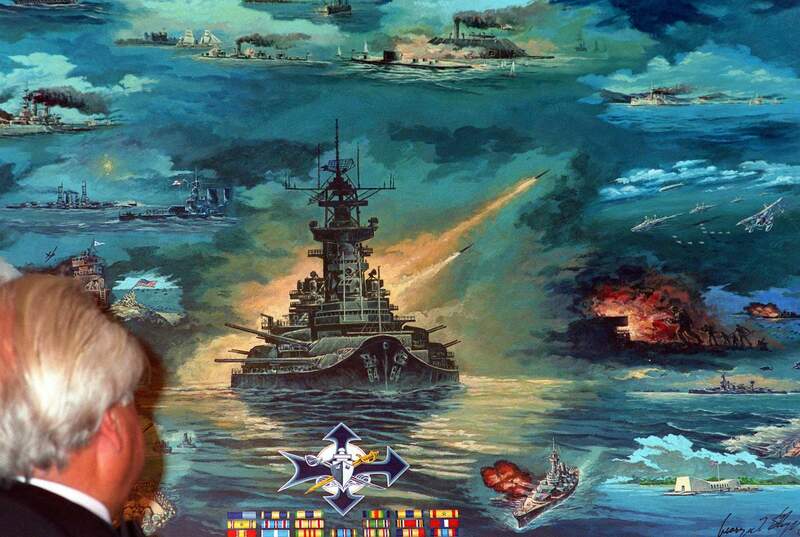 SAILORS on Uncle Sam's battleships do not find life one sweet dream. In addition to being ready to fight at any time, they must be good housekeepers and must keep their vessels clean and shipshape. 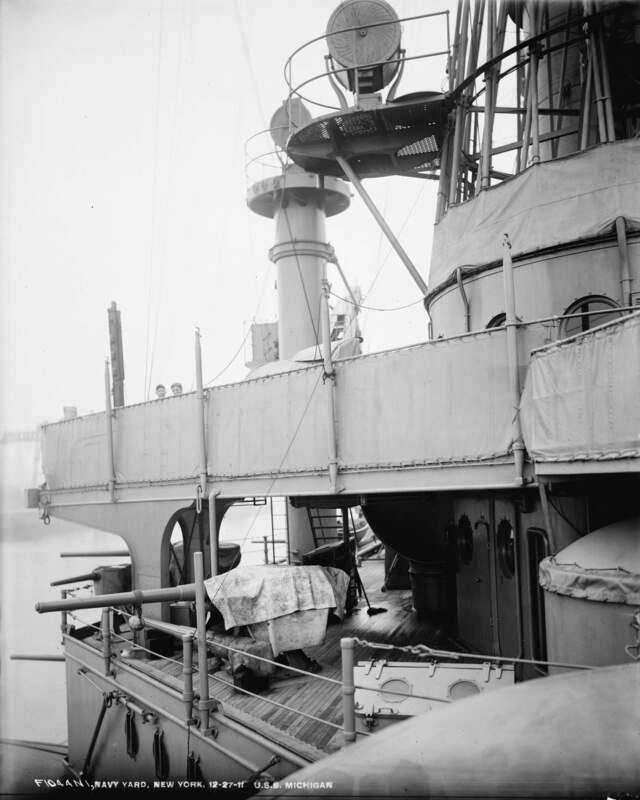 The pictures above show scenes on the battleship Michigan (BB-27), where the blue jackets were scrubbing and holy-stoning the deck in preparation for an official visit. Few men like this sort of work, but it is one of the things that must be done, and, as a rule, the boys do it cheerfully and skillfully. Water is plentiful, and with steam pumps to draw it from the ocean it is used liberally. Image and text provided by Ohio Historical Society, Columbus, OH. Photo from The Democratic Banner. (Mt. Vernon, Ohio) 1898-192?, 18 August 1911, Image 1, PDF courtesy of chroniclingamerica.loc.gov. 781k Fully dressed with flags and with her crew manning the rails, during the naval review off New York City, 3 October 1911. Text courtesy of U.S. Naval Historical Center. 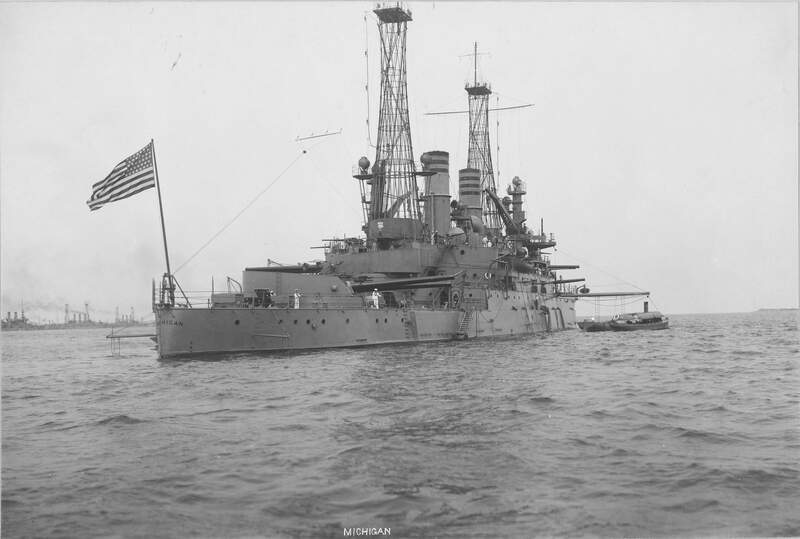 461k Flag less Michigan (BB-27) anchored off Navy Yard, New York on 3 October 1911. USN photo # 19-N-61-6-26 from National Archives and Records Administration (NARA), College Park, Maryland, courtesy of Sean Hert. 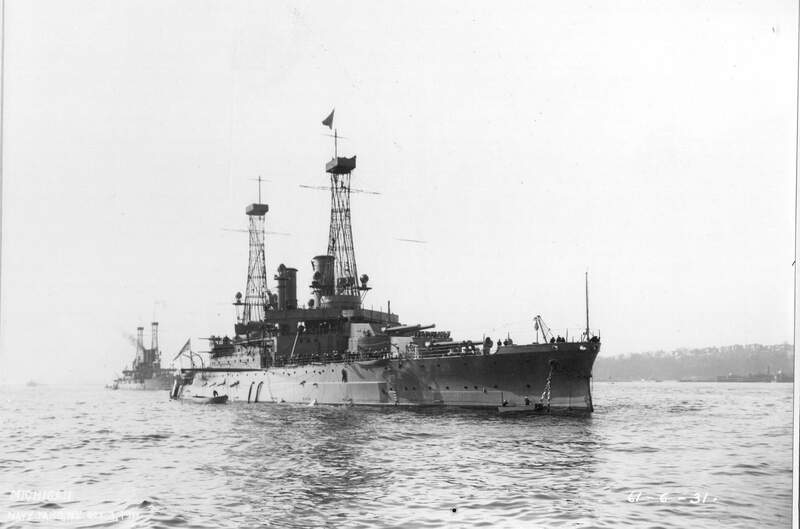 267k Michigan (BB-27) anchored at the Navy Yard, New York on 3 October 1911. USN photo # 19-N-61-6-27 from National Archives and Records Administration (NARA), College Park, Maryland, courtesy of Sean Hert. 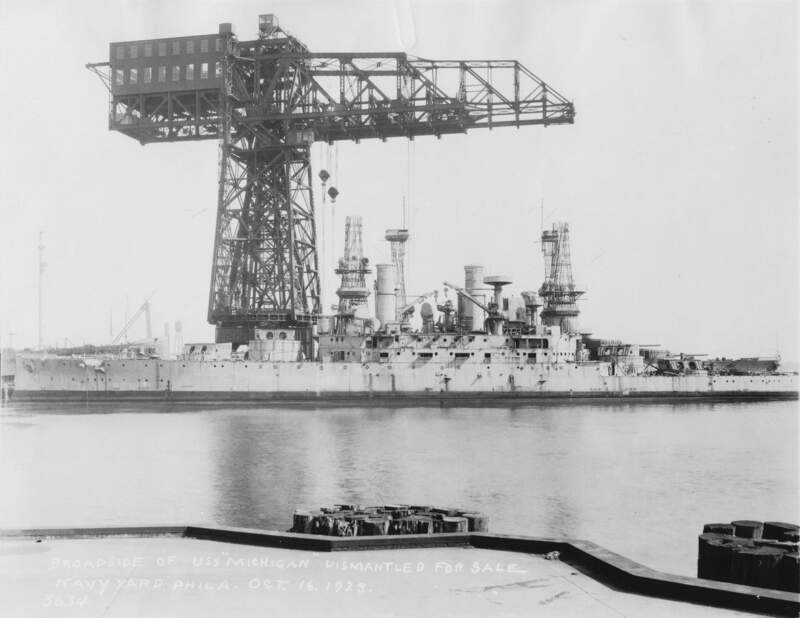 354k A three stacked battleship of the Maine, Virginia or Connecticut classes is anchored behind the Michigan (BB-27) off Navy Yard, New York on 3 October 1911. USN photo # 19-N-61-6-31 from National Archives and Records Administration (NARA), College Park, Maryland, courtesy of Sean Hert. This idea is certainly an improvement of this one as far as raising spirits for the isolated sailor. Image and text provided by University of North Texas; Denton, TX. Photo & text by El Paso Herald. ((El Paso, Tex.) 1901-1931, 13 November 1911, Image 11, courtesy of chroniclingamerica.loc.gov. 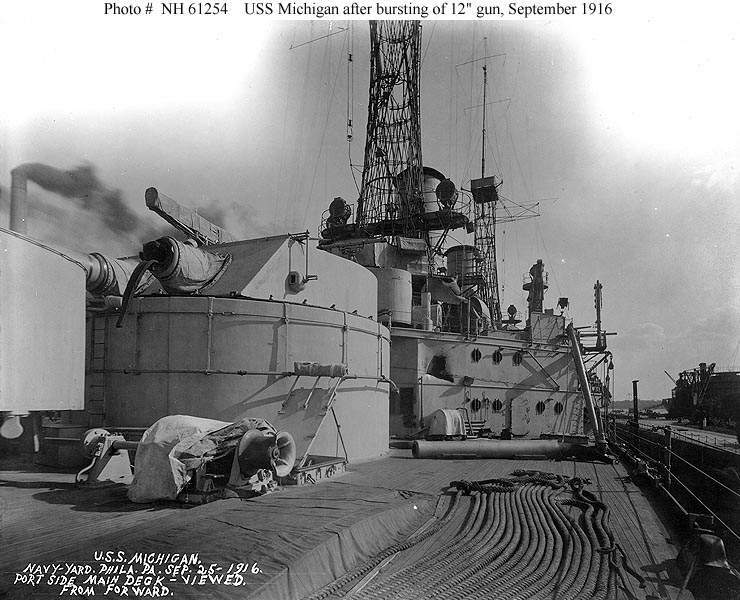 802k Crows nest of the Michigan (BB-27), 1912. 465k Part of the deck of the Michigan (BB-27), 1912. Photo by Enrique Muller Jr.
391k Michigan (BB-27) in the company of other anchored battleships. From left to right, either the Indiana (BB-1) or Massachusetts (BB-2), and 2 three stack from either the Maine, Virginia or Connecticut classes. USN photo # 19N-14915, from National Archives and Records Administration (NARA), College Park, Maryland, courtesy of Sean Hert. 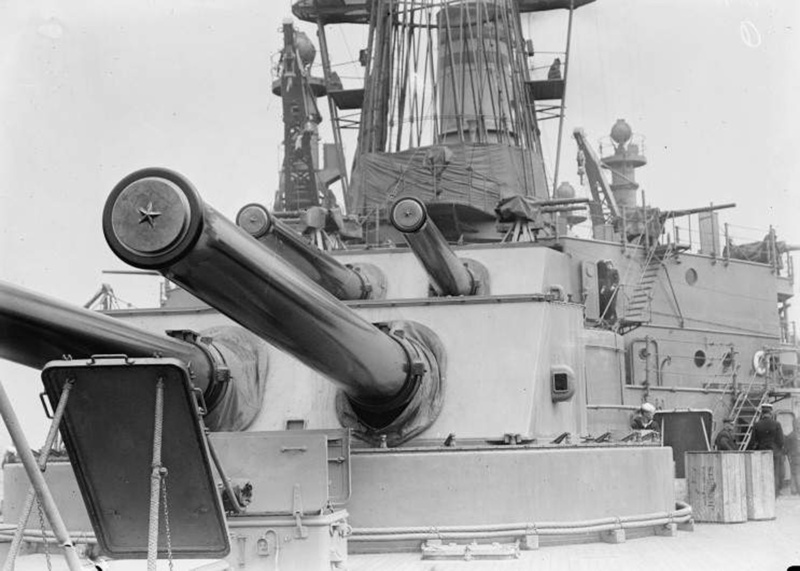 435k Firing a broadside with her 12"/45 main battery guns, 1912. Photographed by Enrique Muller. This image has been retouched to emphasize guns and masts. U.S. 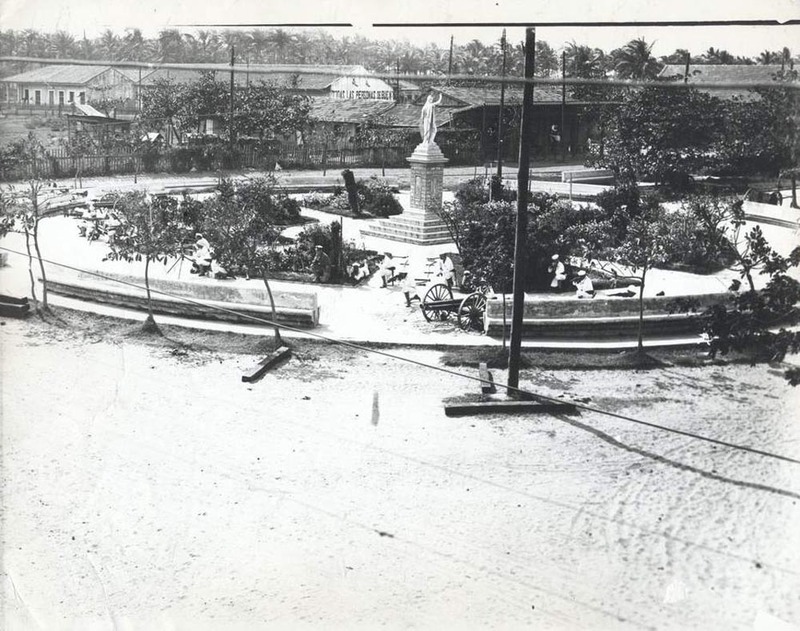 Naval Historical Center Photograph # NH 66299. Image and text provided by University of Oregon Libraries; Eugene, OR. Photo from Polk County Observer. (Monmouth, Polk County, Or.) 1888-1927, 10 May 1912, Image 1, via chroniclingamerica.loc.gov. 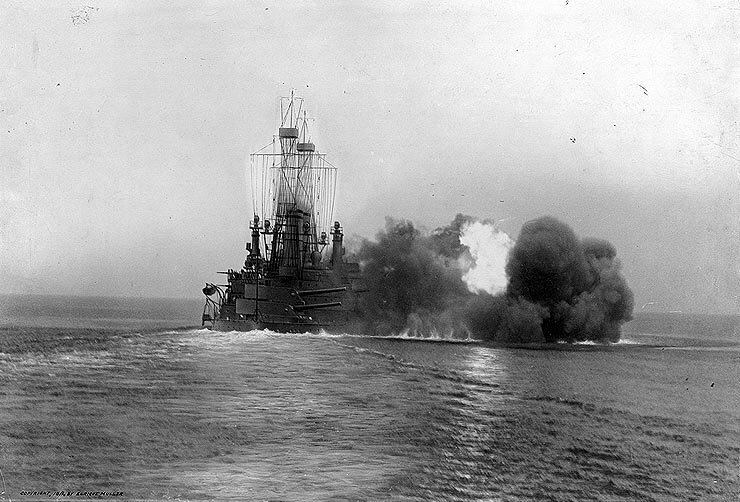 The Michigan (BB-27) firing broadside. 2. Same, nearer view. 3. Going to look at target. 4. Big gun at moment of firing. 5. Battleships in line. 6. Ready to lay mines. 7. Setting up target. 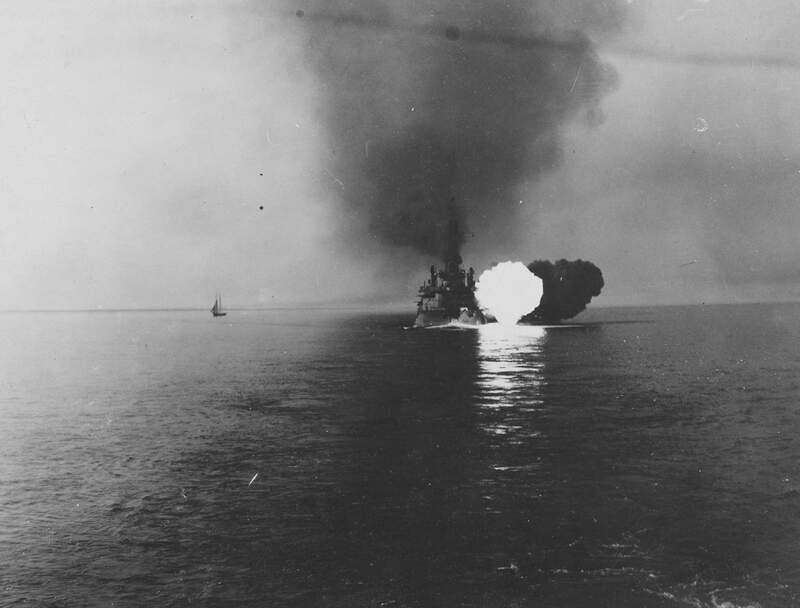 8.Utah (BB-31) firing broadsides. 9. Target in position. Photos by Enrique Muller. Photo from The Hawaiian Star (Honolulu [Oahu]) 1893-1912, 31 May 1912, SECOND EDITION, SECOND SECTION, Image 9, via chroniclingamerica.loc.gov. 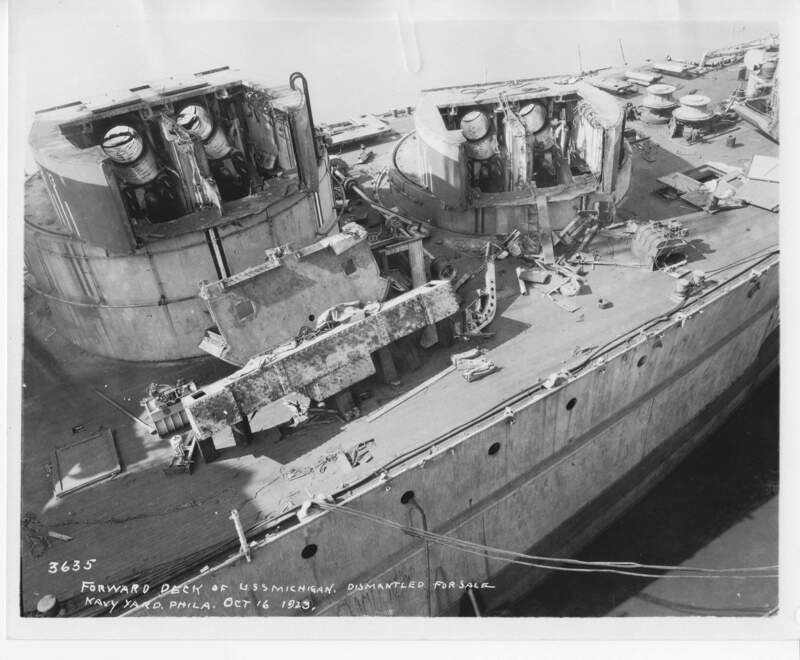 Defects have been found in her main battery, these new 12-inch guns are being placed aboard the Michigan (BB-27), which is undergoing repairs at League Island under rush orders. Image and text provided by University of Hawaii at Manoa; Honolulu, HI. Photo from Evening Bulletin. (Honolulu [Oahu, Hawaii) 1895-1912, 14 March 1912, 3:30 EDITION, Image 7, PDF courtesy of chroniclingamerica.loc.gov. 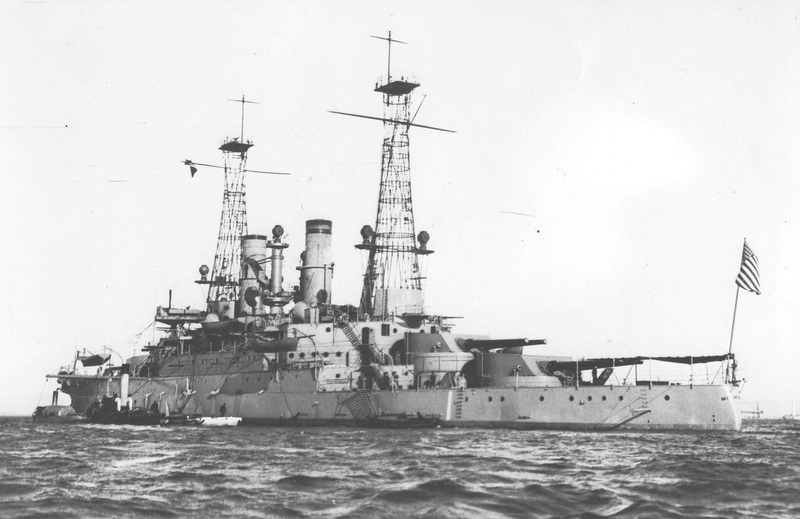 755k Photo of the Michigan (BB-27), circa 1918 and the guns on the Pennsylvania (BB-38). 441k In New York Harbor, during the Naval Review, October 1912. USN photo # 19-N-13573 from National Archives and Records Administration (NARA), College Park, Maryland, courtesy of Sean Hert. 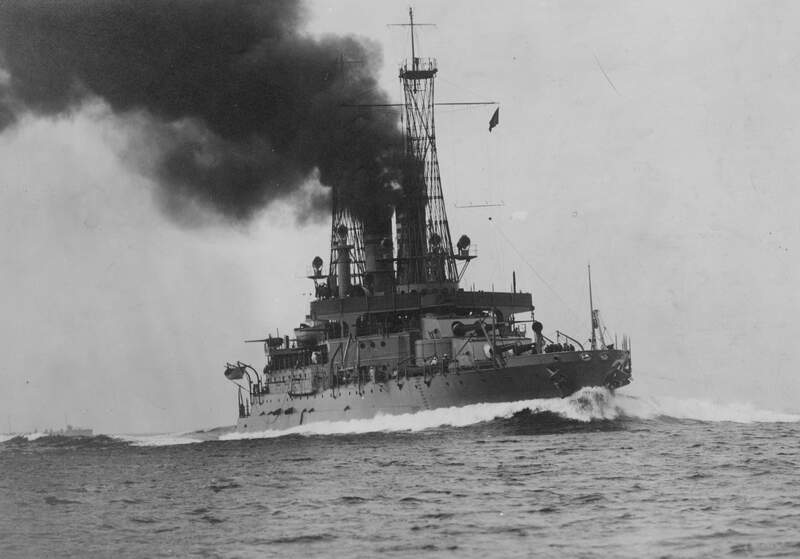 203k Postcard photo by Enrique Muller Jr. of the Michigan (BB-27) underway in July 1913. Photo courtesy of SK/3 Tommy Trampp. 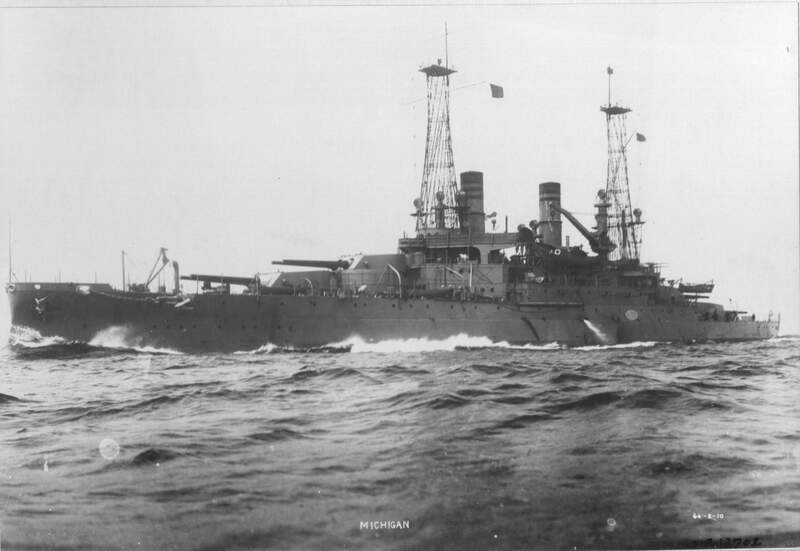 65k Stern view of Michigan (BB-27), possibly when riding at anchor with other ships when she was anchored off Tampico on the 15 July 1913 and remained alert off the Mexican coast until sailing for New York, 13 January 1914, reaching Brooklyn Navy Yard on the 20th. Partial text courtesy of DANFS. ENTRANCE TO HARBOR OF VERA CRUZ. 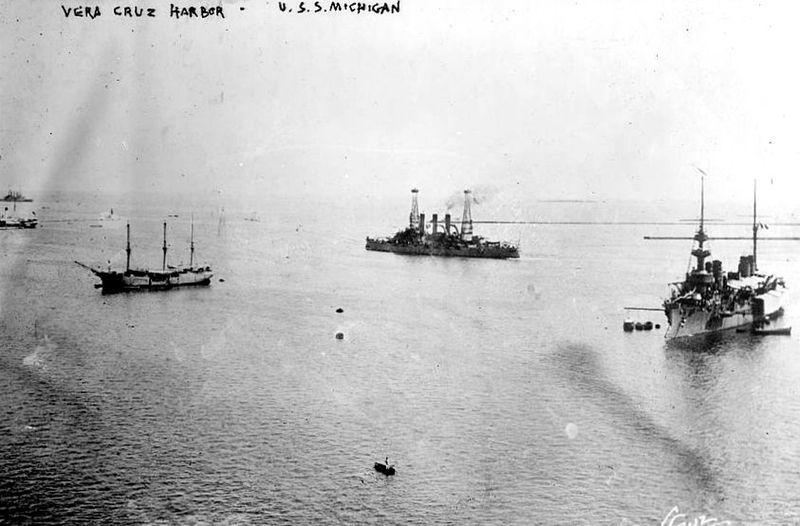 Michigan (BB-27) In Center and French Battleship Conde In Right Foreground. At Extreme Left, a Merchant Sailing Is Shown At Anchor. Image and text provided by Library of Congress, Washington, DC. Photo from The Washington Times. (Washington [D.C.]) 1902-1939, 13 January 1914, LAST AND HOME EDITION, Image 2, courtesy of chroniclingamerica.loc.gov. Inspection of marines on board the United States battleship Michigan (BB-27) in the harbor of Vera Cruz, Mexico. Image and text provided by Louisiana State University; Baton Rouge, LA. Photo & text by The Madison Journal. (Tallulah, Madison Parish, La.) 1888-current, 14 February 1914, Image 3, courtesy of chroniclingamerica.loc.gov. 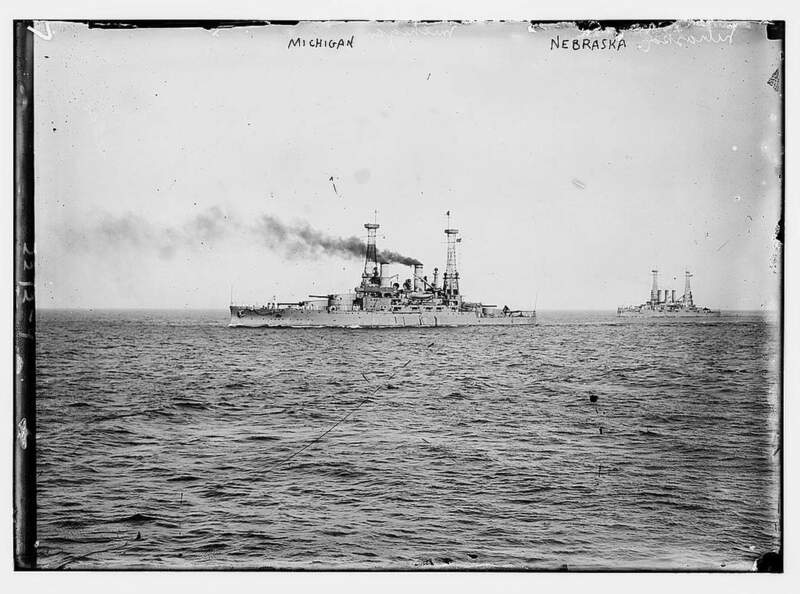 Photos of the battleships North Dakota (BB-29) & Michigan (BB-27) in action. Image and text provided by Library of Virginia; Richmond, VA.
Photo from The Times Dispatch. (Richmond, Va.) 1903-1914, 24 April 1914, Image 5, via chroniclingamerica.loc.gov. 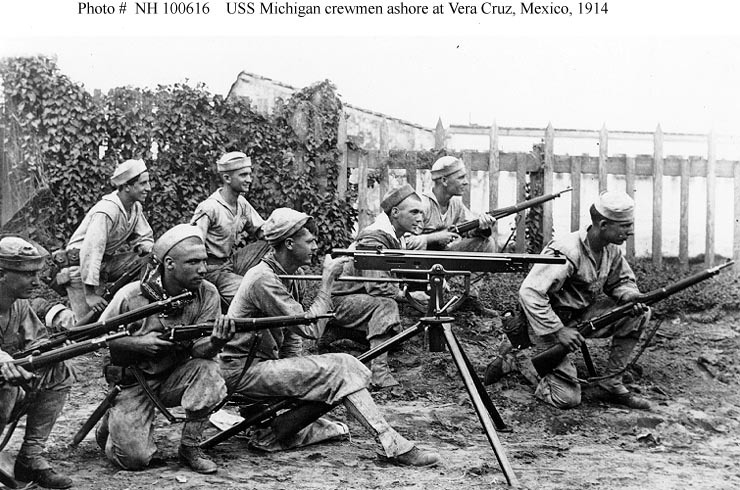 BLUEJACKETS OF BATTLESHIP MICHIGAN (BB-27) OPERATING 5 INCH RIFLE TRAINED ON MEXICAN SEAPORT. Image and text provided by Library of Congress, Washington, DC. Photo & text by The Washington Times. (Washington [D.C.]) 1902-1939, 26 April 1914, Sunday Evening EDITION, Image 2, courtesy of chroniclingamerica.loc.gov. 335k Michigan (BB-27) and other unidentified vessels anchored in Vera Cruz Harbor during the 1914 U.S. occupation during the Mexican Revolution. Source: Source: Library of Congress, Photo No. LC-B2-2956-15 via Mike Green. 169k Rifle and field gun practice on board Michigan (BB-27). USN photo # LC-USZ62-49081, courtesy of the Library of Congress, from the National Museum of the U.S. Navy, courtesy of flickr.com. 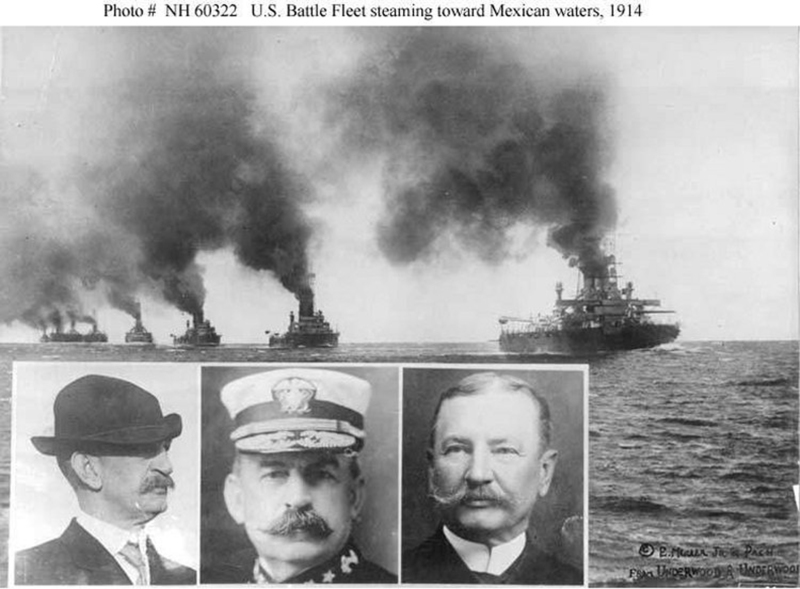 117k Taking on coal from a Navy collier, while off Vera Cruz, Mexico, in April-June 1914. 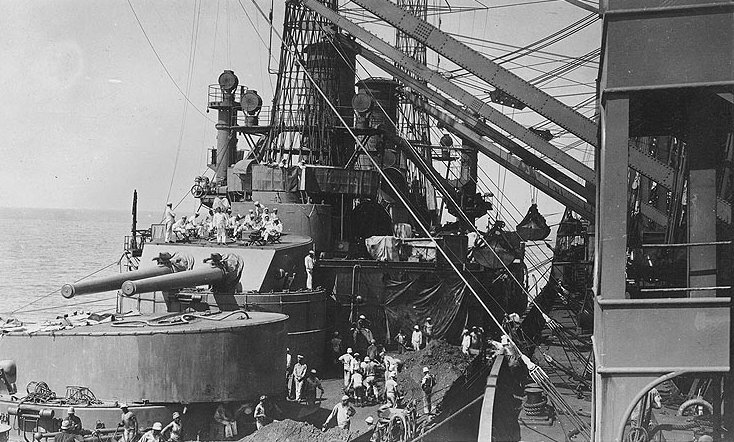 Note ship's band atop Turret # 2, playing to encourage the crewmen at work moving coal. U.S. Naval Historical Center Photograph # NH 73774. 115k Men of the Michigan (BB-27) Battalion on the outskirts of Vera Cruz, circa late April 1914. They are wearing dyed "Whites" and are armed with a Colt M1895 machine gun and M1903 rifles. Note the colorful bandannas worn by two of these men. U.S. Naval Historical Center Photograph # NH 100616. Top left. A busy day on the Michigan coaling from collier. Bottom. Landing party. Top right. As the fleet looked approaching; Vera Cruz. Center. Senior (wardroom) officers, battleship Michigan. Bottom. Big guns of the Michigan Image and text provided by Library of Congress, Washington, DC. Photo from Evening Star. (Washington, D.C.) 1854-1972, 30 April 1914, Image 4, via chroniclingamerica.loc.gov. 946k As the battleship Michigan (BB-27) slowly steamed into the harbor of Vera Cruz the sailors looking over the side got their first view of the peaceful war as the dead bodies of marines were carried back to their ships. Image and text provided by Library of Congress, Washington, DC. Photo from New-York Tribune. (New York [N.Y.]) 1866-1924, 30 April 1914, Image 1, courtesy of chroniclingamerica.loc.gov. ORDER TO FRONT SHATTERED HOPE OF MANY WIVES. Image and text provided by Library of Congress, Washington, DC. Photo from The Washington Herald. (Washington, D.C.) 1906-1939, 3 May 1914, Image 28,via chroniclingamerica.loc.gov. 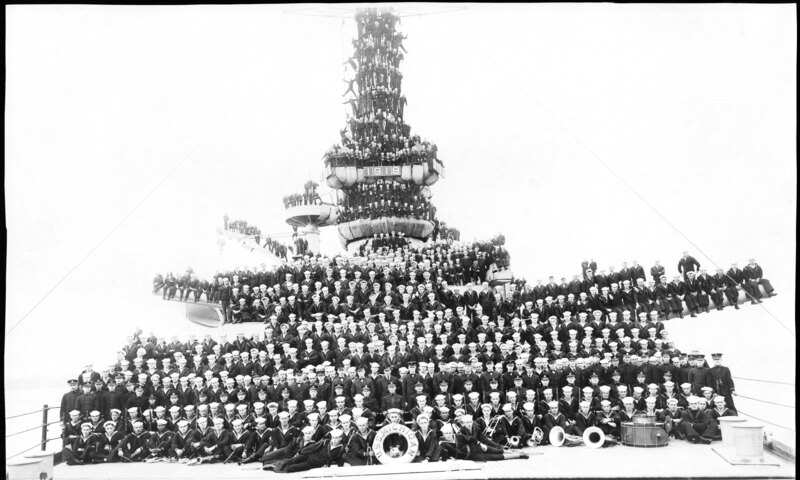 679k U. S. MARINES ON BATTLESHIP MICHIGAN (BB-27) READY FOR WAR IN VERA CRUZ HARBOR Image and text provided by Ohio Historical Society, Columbus, OH. Photo & text by The Democratic Banner.(Mt. Vernon, Ohio) 1898-192?, 05 May 1914, Image 2, courtesy of chroniclingamerica.loc.gov. 122k Landing craft leaving Michigan (BB-27). USN photo # LC-USZ62-49082 courtesy of the Library of Congress, from the National Museum of the U.S. Navy, courtesy of flickr.com. 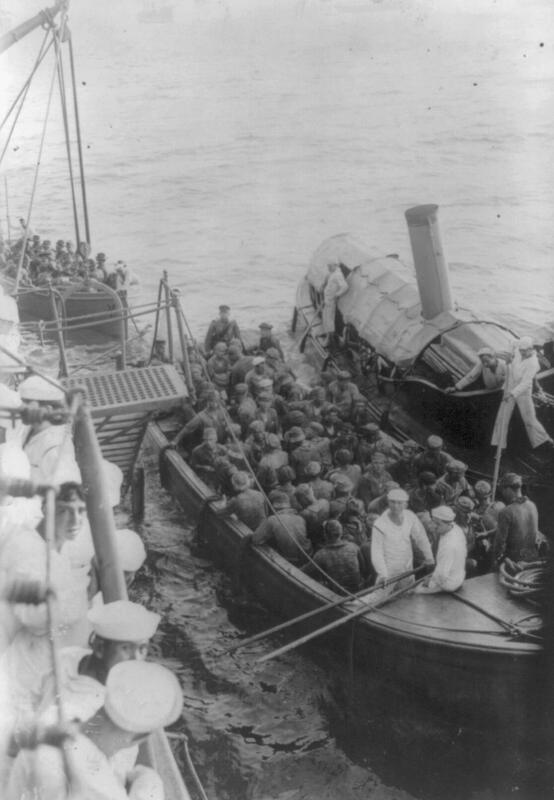 786k Marines Leaving Warships For the Wharf in Vera Cruz Image and text provided by University of South Carolina; Columbia, SC. Photo from The Anderson Daily Intelligencer. (Anderson, S.C.) 1914-1917, 13 May 1914, Image 2, courtesy of chroniclingamerica.loc.gov. USN photo # LC-USZ62-49087 courtesy of the Library of Congress, from the National Museum of the U.S. Navy, courtesy of flickr.com. This interesting picture was taken aboard the battleship Michigan (BB-27) off Vera Cruz. It shows the sailors lying flat on the deck with guns pointed at the city. They later took part in the conflict in the streets of the city and were used to restore order. 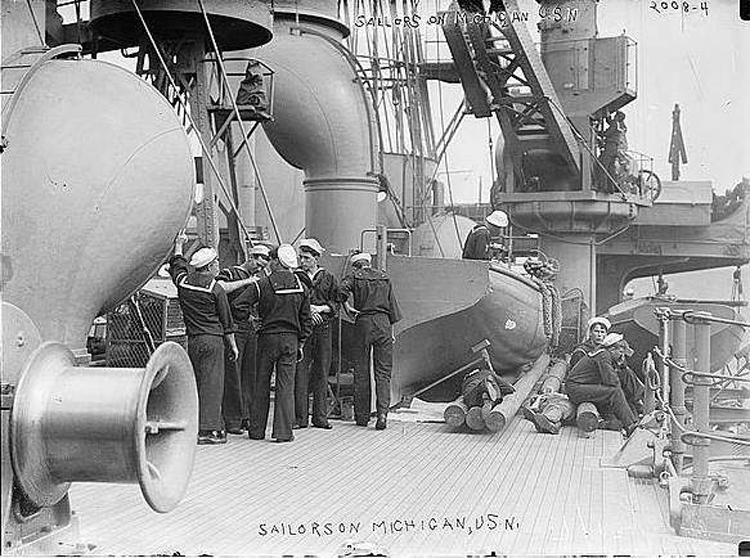 Bluejackets In Action Aboard Michigan. Image and text provided by University of Kentucky, Lexington, KY.
Photo from The Bee. ( (Earlington, Ky.) 1889-19? ?, 15 May 1914, Image 6, courtesy of chroniclingamerica.loc.gov. 186k Battery from Michigan (BB-27) stationed at the Plaza of Alameda at Vera Cruz during the 1914 Mexican Revolution. Associated Press text & photo courtesy of San Francisco Examiner via David S. Smith. 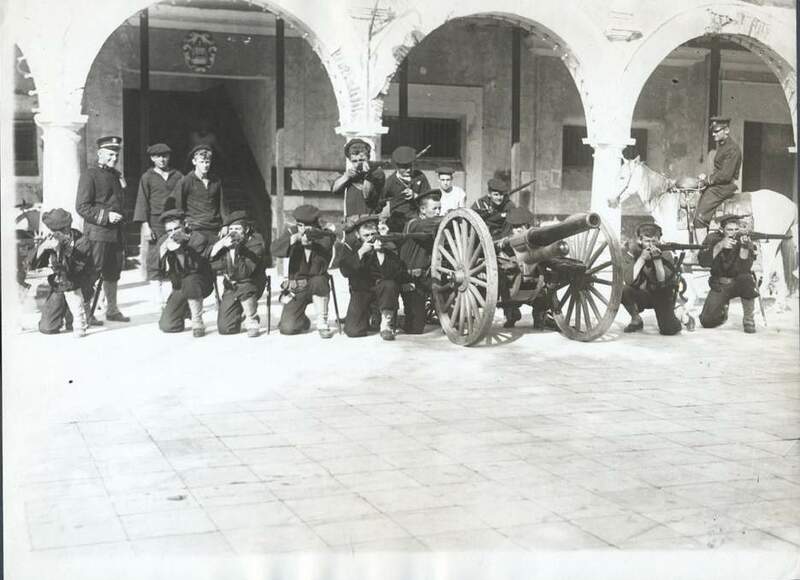 68k U.S. blue jackets with 3 inch field piece from Michigan (BB-27) guarding the Government building at Vera Cruz during the 1914 Mexican Revolution. Associated Press text & photo courtesy of San Francisco Examiner via David S. Smith. 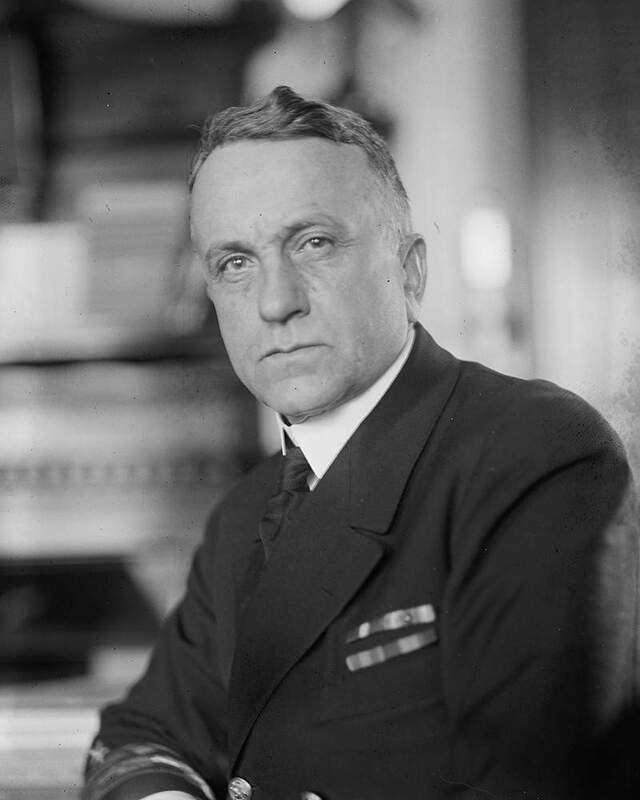 Captain Albert P. Niblack was in charge of the Battleship Michigan when it grounded off Capes Henry coast on Thanksgiving day. He was feeling his way into the harbor between the Capes Henry & Charles, and as a thick fog had settled down he concluded not to try to make the entrance to Chesapeake. He anchored some ten miles out to sea. In the morning when the tide went out he found the stern of the vessel, supposed to be in thirty feet of water, was resting on the bottom. 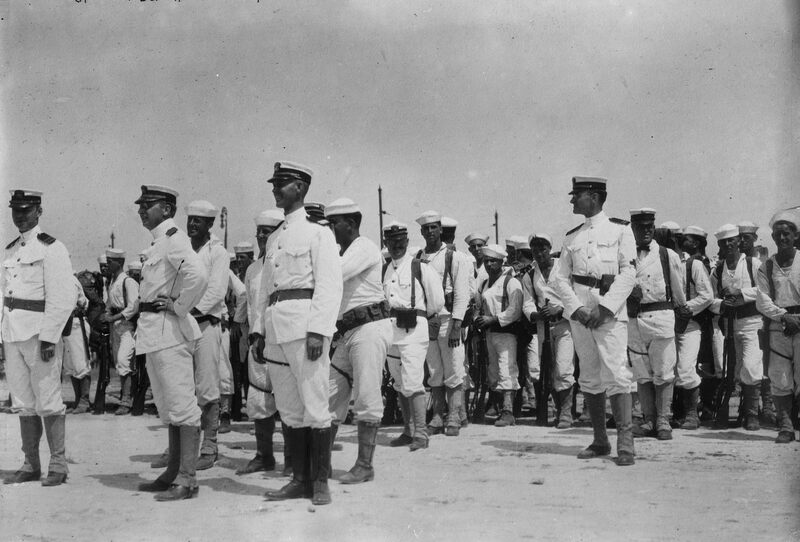 He is also seen here with American sailors during the U.S. occupation of Vera Cruz in April. Image and text provided by University of Oregon, Knight Library; Eugene, OR. Photo from The Evening Herald. (Klamath Falls, Or.) 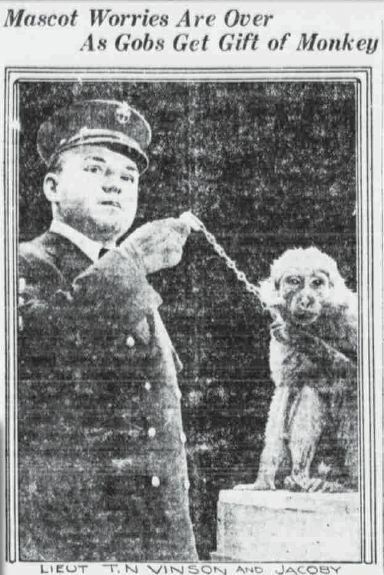 1906-1942, 12 December 1914, Image 1, courtesy of chroniclingamerica.loc.gov. Insert USN photo # LC-DIG-GGBAIN-16377 courtesy of the Library of Congress, from the National Museum of the U.S. Navy, courtesy of flickr.com. 729k UNITED STATES DREADNOUGHT AGROUND. The Michigan (BB-27) is stranded on the tail of the Horseshoe, near the lightship of Cape Henry, on the Virginia coast. Image and text provided by Library of Congress, Washington, DC. Photo from The Washington Herald. (Washington, D.C.) 1906-1939, 01 December 1914, Image 5. 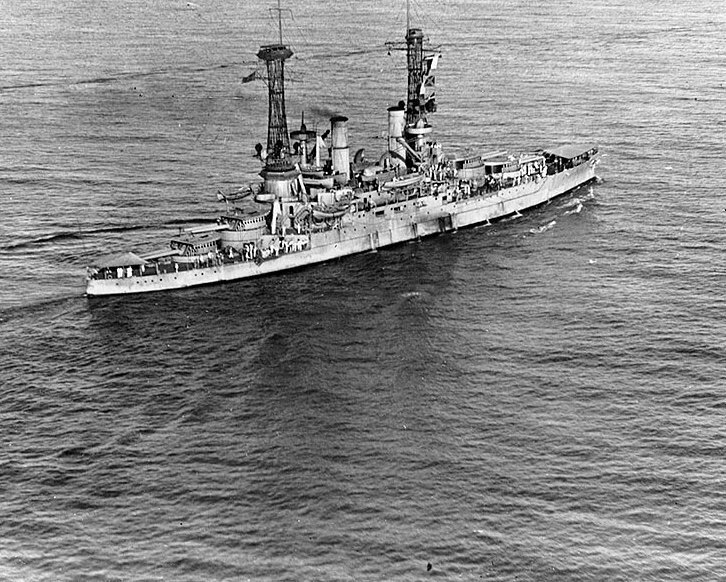 377k Taken from the U.S. battleship Michigan (BB-27), the target, anchored in Chesapeake Bay, with the Rhode Island (BB-17) standing by passing a line to take it in tow. The ships take turns at towing the target. Photo by Enrique Mueller Jr.
Photo from New-York Tribune. (New York [N.Y.]) 1866-1924, 9 May 1915, Image 51, courtesy of chroniclingamerica.loc.gov. Sam Taylor of the Michigan (BB-27) winning the middle weight championship of the Atlantic Fleet from Mike Davis of the New Hampshire (BB-25). 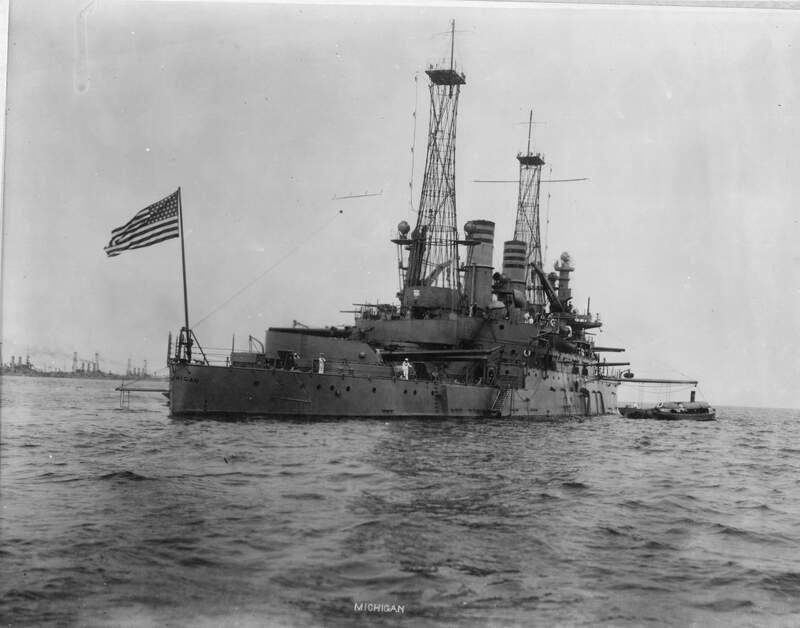 The light heavyweight title of the Atlantic fleet changed hands when Sam Taylor of the battleship Michigan defeated Mike Davis of the New Hampshire. Both boys are nifty with the gloves, and quite a crowd gathered on the Michigan in the North river to see the contests of ring skill arranged as a diversion for the fleet members while in New York's harbor. Photo by International News Agency, courtesy of memory.loc.gov. Photo from The Evening World. (New York, N.Y.) 1887-1931, 11 May 1915, Final Edition-Extra, Image 14, via chroniclingamerica.loc.gov. 2.28k BATTLESHIP MICHIGAN (BB-27), WITH ATLANTIC FLEET, CRACK SHOT OF UNITED STATES NAVY. 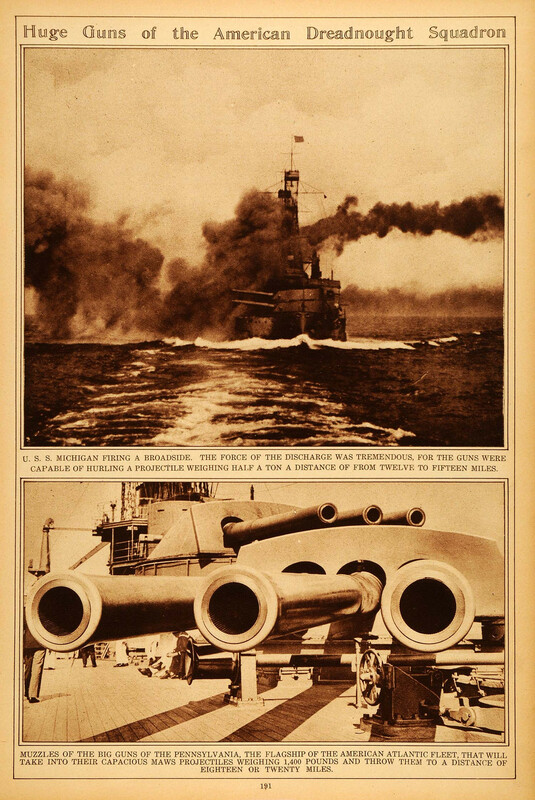 The Dreadnought Michigan at recent target practice demonstrated that she is one of the crack shots at the navy. In the accompanying illustration members of her crew are shown clustered about her twelve inch guns. 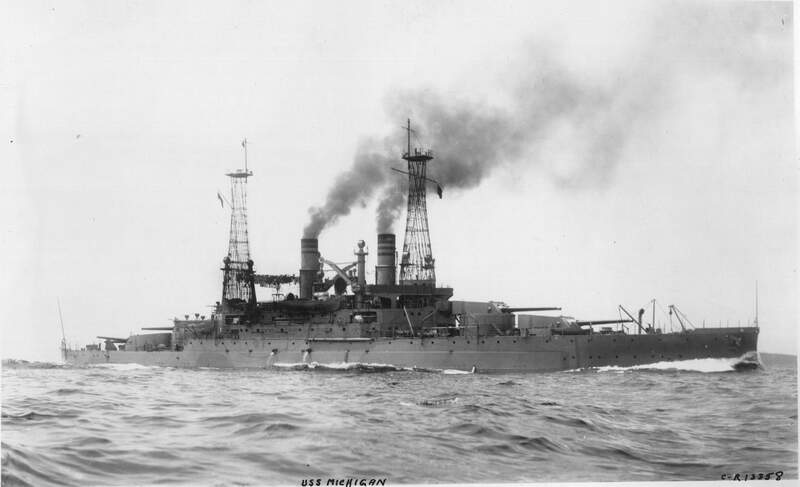 The Michigan was one of the Atlantic fleet which was on review in New York harbor. Image and text provided by State Historical Society of Iowa. Photo from Evening Times-Republican. (Marshalltown, Iowa) 1890-1923, 26 May 1915, Image 5, via chroniclingamerica.loc.gov. 513k The thunder of the U.S. battleship Michigan's (BB-27) broadside on the lens. The black smoke is the escaping gas which first follows the ignition of the powder. The big white puff is just ahead of the flame spurt from the muzzle. Taken during recent maneuvers in Narraganset Bay. Image and text provided by Library of Congress, Washington, DC. Photo from New-York Tribune. (New York [N.Y.]) 1866-1924, 29 August 1915, Image 49, courtesy of chroniclingamerica.loc.gov. Photo by Enrique Muller Jr. for the Committee of Public Information. 131k Captain # 5 of the Michigan (BB-27), Carlo Bonaparte Brittain, 01.12.1915. Photo courtesy of the Library of Congress & submitted by Bill Gonyo. 62k "Battleship South Carolina (BB-26) at a distance of nine miles, firing on a target seen between the towers of water during the naval games in Chesapeake Bay, just concluded. 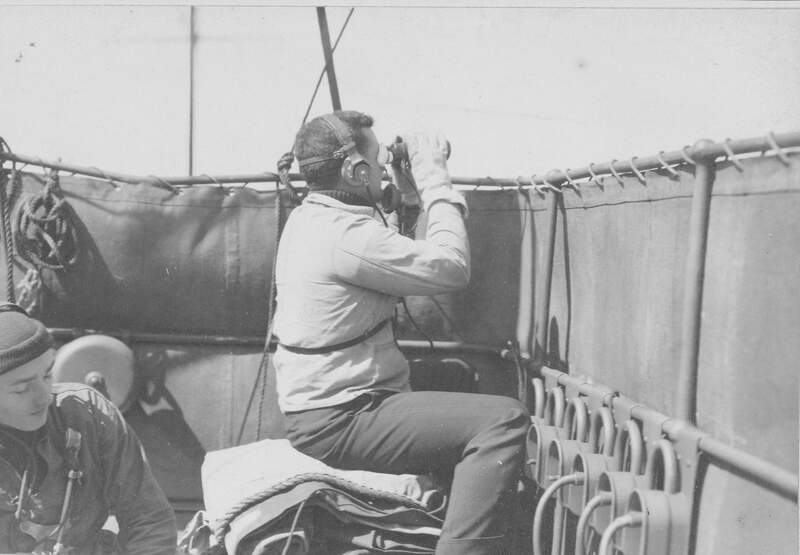 The observers on a sister ship in the foreground are only a few hundred yards away." Text courtesy of N.Y. Times 31 October 1915, page 8. USN photo by Enrique Muller Jr, courtesy of memory.loc.gov. 738k FLEET READY FOR "ANY EMERGENCY," SECRETARY DANIELS TOLD. 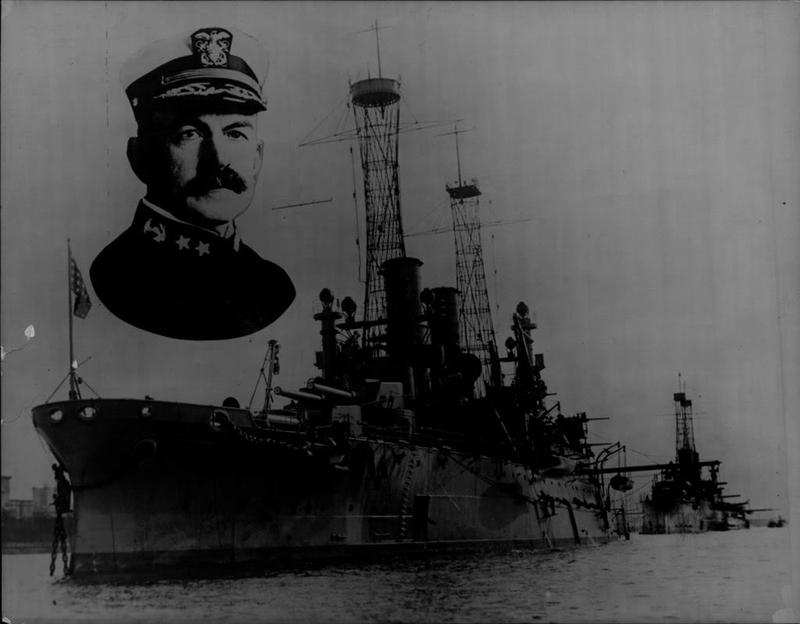 North Atlantic fleet, led by battleship Michigan (BB-27), at maneuver; Vice Admiral Mayo" (left); Captain Albert P. Niblack, commander of the Michigan. In every respect, the shooting was the best the navy ever did." This sentence, taken from the report of Vice Admiral Mayo on the recent target practice of the Atlantic fleet in Cuban waters and just made public by Secretary Daniels, forms the substance of the report, accompanied as it is by the admiral's simultaneous declaration that the fleet is ready for any emergency. Image and text provided by University of Utah, Marriott Library. Photo from The Ogden Standard. (Ogden City, Utah) 1913-1920, 24 April 1916, 4 P.M. CITY EDITION, Image 6, via chroniclingamerica.loc.gov. 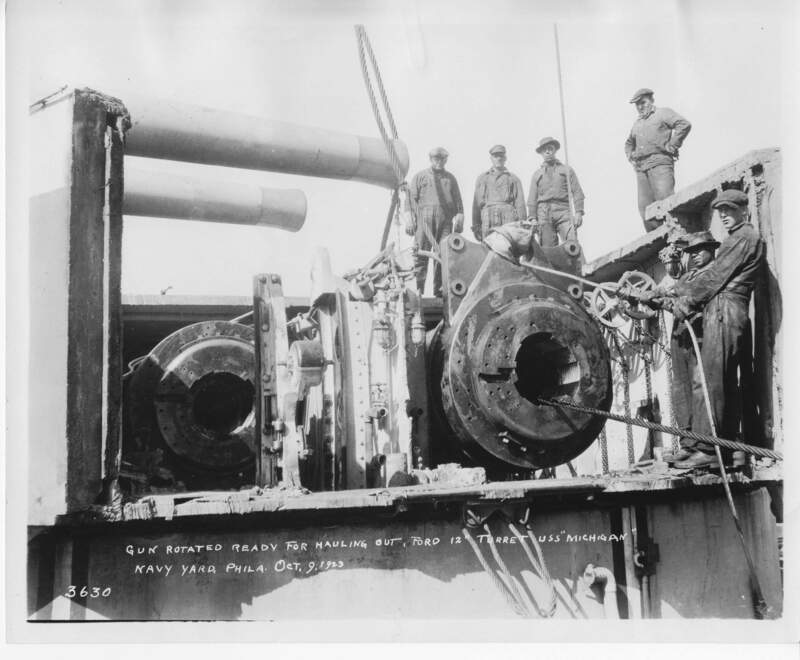 Defects have been found in her main battery, these new 12-inch guns are being placed aboard the Michigan (BB-27), which is undergoing repairs at League Island under rush orders. Image provided by: Penn State University Libraries; University Park, PA.
Photo from The Evening Public Ledger. (Philadelphia [Pa.]) 1914-1942,Night Extra, 26 April 1916, Image 1, PDF courtesy of chroniclingamerica.loc.gov. 482k Exclusive photograph showing how a 12-inch gun on battleship Michigan (BB-27) cracked along virtually its entire length in recent firing practice off Guantanamo Bay. 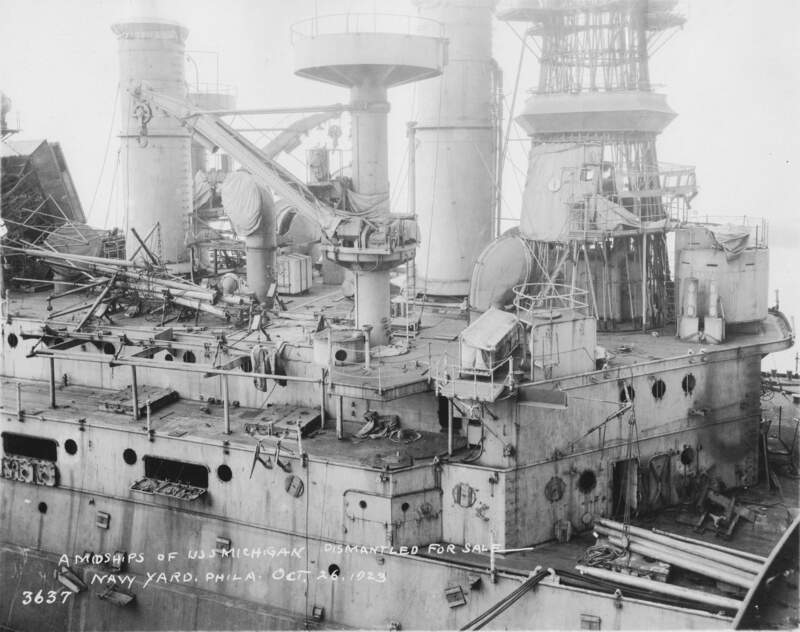 As a result of the discovery of this defect, all four big guns in the forward turrets have been discarded and new ones are being mounted while the ship is undergoing repairs at the Navy Yard. Image provided by: Penn State University Libraries; University Park, PA.
Photo from The Evening Public Ledger. (Philadelphia [Pa.]) 1914-1942,Postscript Edition, 27 April 1916, Image 16. PDF courtesy of chroniclingamerica.loc.gov. This photograph shows a sailor cleaning out the breech of a 12-lnch 45-caliber gun. 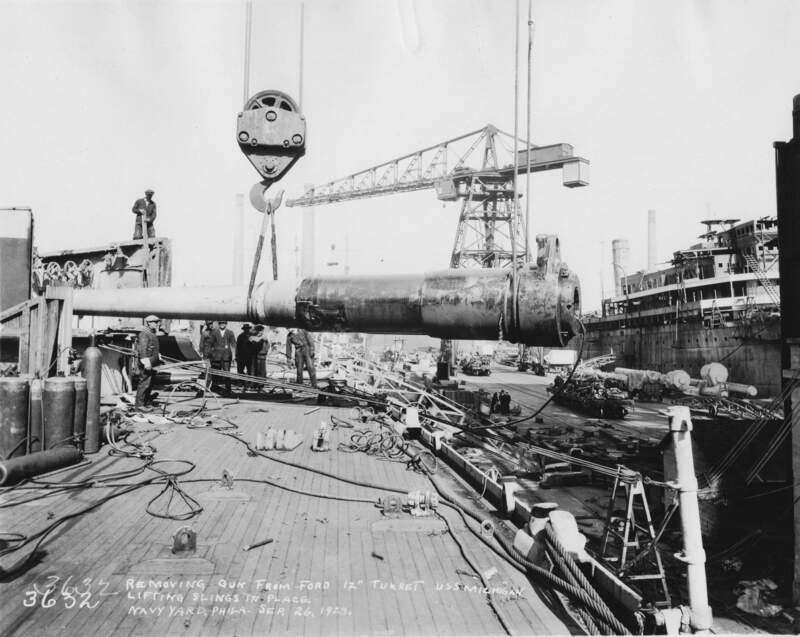 The big cannon is to be installed on the Michigan (BB-27), now undergoing repairs at the League Island navy yard in Philadelphia. Image and text provided by University of Oregon Libraries; Eugene, OR. Photo from East Oregonian: E.O. (Pendleton, Umatilla Co., Or.) 1888-current, 08 May 1916, DAILY EVENING EDITION, Image 3, PDF courtesy of chroniclingamerica.loc.gov. 492k ADMIRAL OF THE ARGENTINE REPUBLICS NAVY PAYS A VISIT TO THE NAVY YARD. 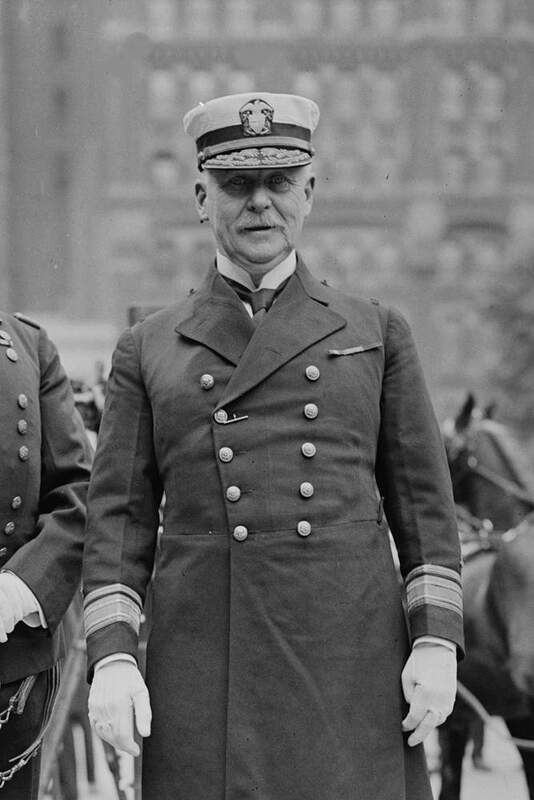 Admiral Martin is the trim-looking figure with the derby hat seen surrounded by American officers on board the dreadnought Michigan (BB-27), which he inspected in the course of his visit. Image provided by: Penn State University Libraries; University Park, PA.
Photo from The Evening Public Ledger. (Philadelphia [Pa.]) 1914-1942, 13 May 1916, Night Extra, Image 22, via chroniclingamerica.loc.gov. NR LIBERTY ENLIGHTENING THE WORLD AT NIGHT. Image and text provided by Mississippi Department of Archives and History. Photo from The Hattiesburg News. (Hattiesburg, Miss.) 1908-1917, 13 June 1916, LAST AND HOME EDITION, Image 3, via chroniclingamerica.loc.gov. NR LIBERTY ENLIGHTENING THE WORLD AT NIGHT. This photograph taken on the night of May 31 shows the illumination of the famous Bartholdi Monument in New York Harbor by searchlights of the pennant-winning battleship Michigan (BB-27). For half an hour this beautiful spectacle was viewed by thousands, who were thrilled by the majestic Statue of Liberty standing out of the darkness, and by the American flags at the battleship's mastheads, emblazoned by two shafts of light. The illumination was ordered by the Secretary of the Navy to afford an approximation of the effect that will be produced by the permanent lighting of tbe statue proposed by The New York World. Congress has passed an amendment to the Rivers and Harbors bill authorizing acceptance by the Federal Government of a fund of $30,000 being raised by The World to purchase an illuminating plant, which the Government will maintain. Many small contributions to this fund are sought in order that the lighting of the famous statue shall be in keeping with the traditions of this gift of the people of France to the people of the United States. Image and text provided by Arizona State Library, Archives and Public Records; Phoenix, AZ. Photo from Arizona Republican. (Phoenix, Ariz.) 1890-1930, 22 June 1916, Image 7, via chroniclingamerica.loc.gov. 2.57k Nine photo PDF taken aboard Michigan (BB-27) showing views of damage from explosion of a 12" gun of turret two, taken at the Philadelphia Navy Yard, 25 September 1916. Source: U.S. Naval History and Heritage Command, Photos No. NH 46284-93 via Mike Green. 75k View looking aft along the port side, showing barrel of burst 12-inch gun on deck with the gun's rear portion in Turret # 2. 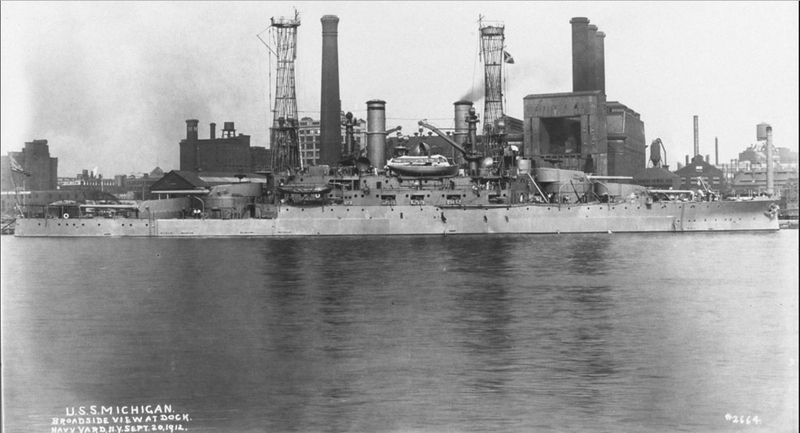 Photographed at the Philadelphia Navy Yard, Pennsylvania, 25 September 1916. 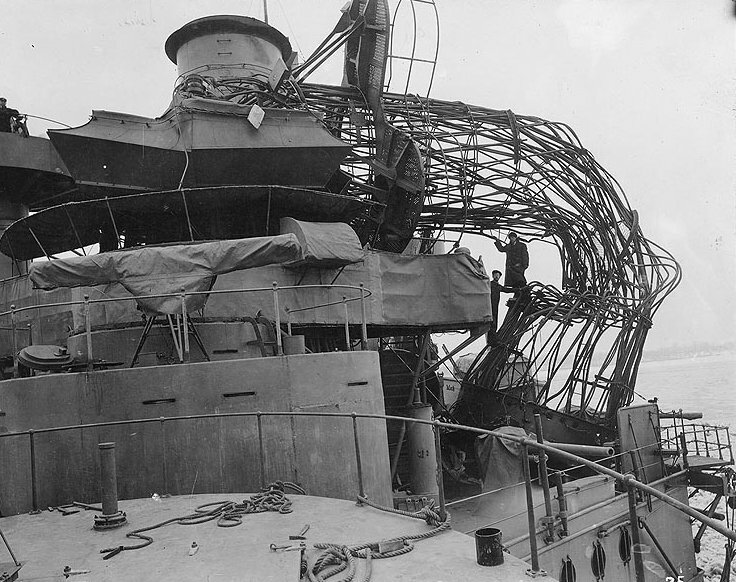 Note holes in superstructure and in the "cage" foremast caused by this accident. U.S. Naval Historical Center Photograph # NH 61254. 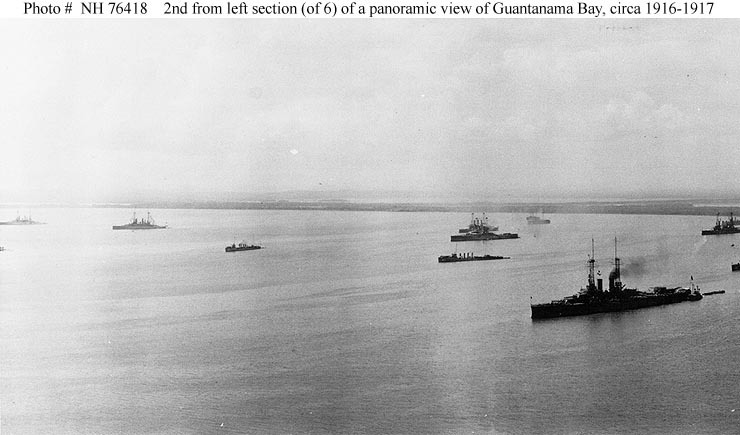 56k U.S. Atlantic Fleet at Guantanamo Bay, Cuba, circa 1916-1917. 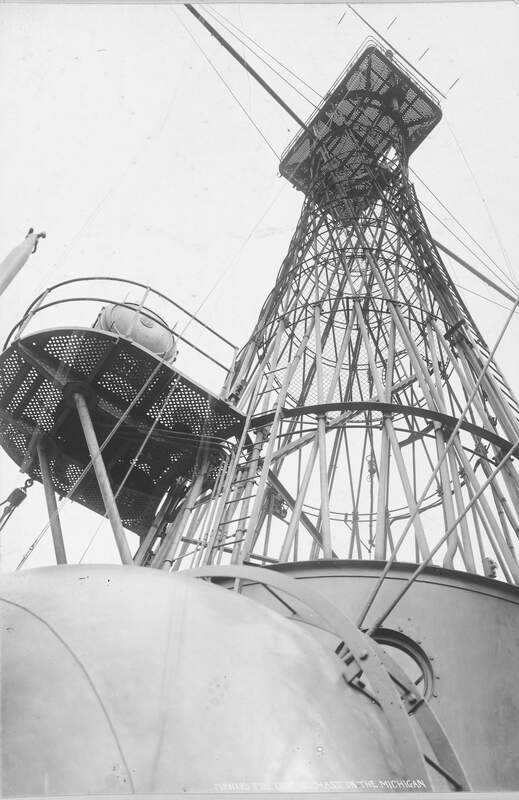 Second section from left (of six) of a panoramic photograph taken from the Naval Station radio tower. 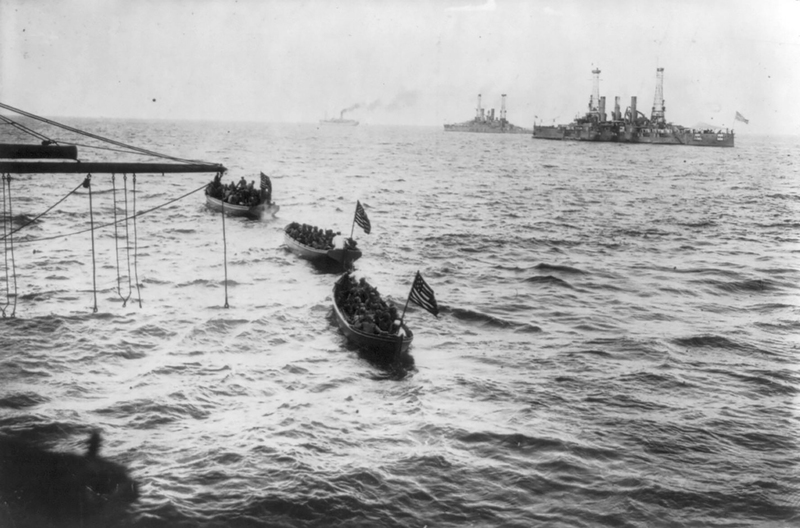 Among the ships present are: battleships South Carolina (BB-26) and Michigan (BB-27)(toward the left, in no particular order); destroyers Drayton (left center) and Aylwin (center, middle distance); and a battleship that is either Wyoming (BB-32) or Arkansas (BB-33) (right foreground). U.S. Naval Historical Center Photograph # NH 76418, courtesy of the Naval Historical Foundation, Washington, D.C. Donation of MMC Jesse Forton, USN (Retired), 1972. 2.60k Photographed by O.W. Waterman, Hampton, Virginia, circa 1916-17. She is wearing horizontal "two-tone" paint scheme, possibly a camouflage experiment. U.S. Naval Historical Center Photograph # NH 106438. The original photograph, given to Michigan (SSGN-727) by Mr. Sanford Aronoff, was donated by the ship to the Naval History and Heritage Command in 2008. 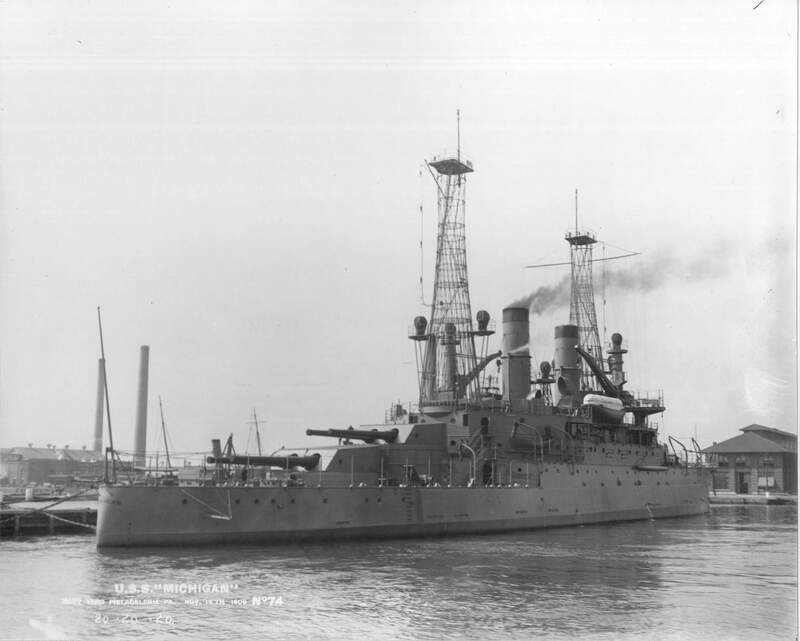 OUR FIRST ALL BIG GUN BATTLESHIP, THE MICHIGAN (BB-27) PLANNED IN 1905. Image and text provided by The New York Public Library, Astor, Lenox and Tilden Foundation. Photo from The Sun. (New York, [N.Y.]) 1916-1920, 25 February 1917, Section 5 Special Feature Supplement, Image 4, via chroniclingamerica.loc.gov. 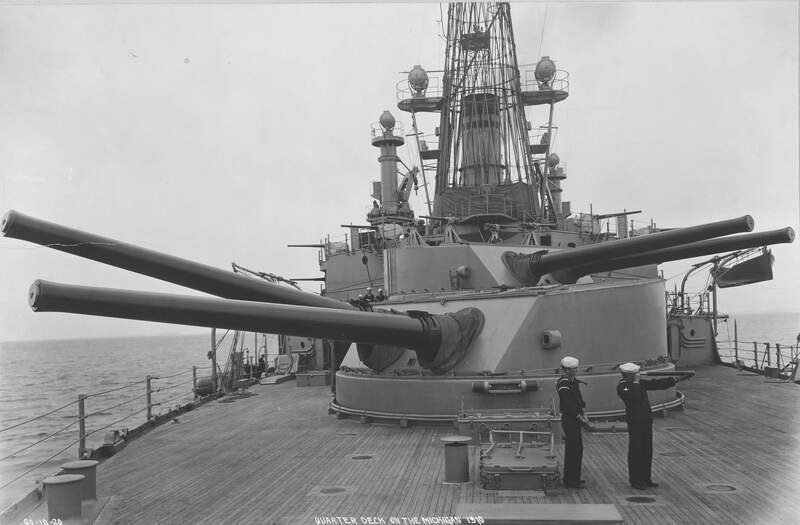 413k Naval Guns on the Battleship Michigan (BB-27). Photo by Getty Images courtesy of gettyimages.com. 545k Distinctly unusual naval picture looking bow on toward the fighting top and fire control station of the Michigan (BB-27)-a photograph taken from the top of the dreadnought's aft skeleton mast. Image and text provided by Library of Congress, Washington, DC. Photo from New-York Tribune. (New York [N.Y.]) 1866-1924, 25 November 1917, Image 53, via chroniclingamerica.loc.gov. 467k A brand new picture of the Arizona (BB-39), the latest dreadnought to join the Atlantic Fleet, hitting it up at a 16 knot clip in line of breast formation. Below, another new photo of the Arizona coming bow on at full speed with guns trained for a starboard broadside. 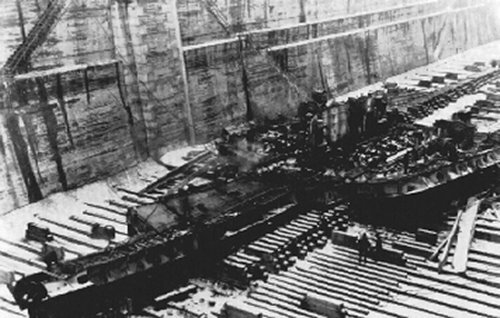 Below and to the left, the Michigan (BB-27) with decks cleared for action. A striking an intimate picture that gives one a definite impression of this sea fighter's businesslike efficiency. Image and text provided by Library of Congress, Washington, DC. Photo courtesy of New-York Tribune. (New York [N.Y.] 1866-1924, 2 December 1917, Image 59 via chroniclingamerica.loc.gov. 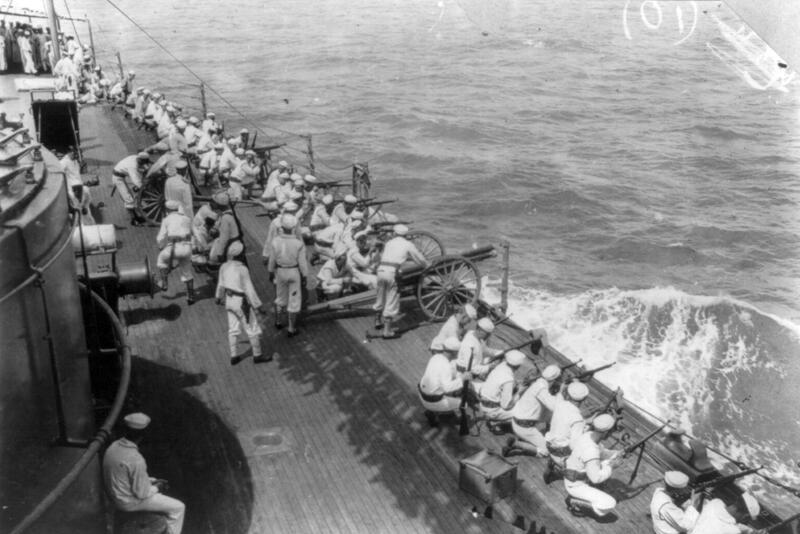 647k Gun Practice, Artillery of the Michigan (BB-27), circa 1917-18. Photographer: Enrique Muller, Jr.
434k Gun Practice - On board Michigan (BB-27), judging the firing distance in order to tell the gun crew how to place their gun, circa 1917-18. Photographer: Enrique Muller, Jr.
2.70k Michigan's (BB-27) Officers and Crew, photographed on board in 1918 by O.W. Waterman, Hampton, Virginia. Note the ship's bandsmen seated in the front row with their musical instruments. U.S. Naval Historical Center Photograph # NH 106439. The original photograph, given to Michigan (SSGN-727) by Mr. Sanford Aronoff, was donated by the ship to the Naval History and Heritage Command in 2008. 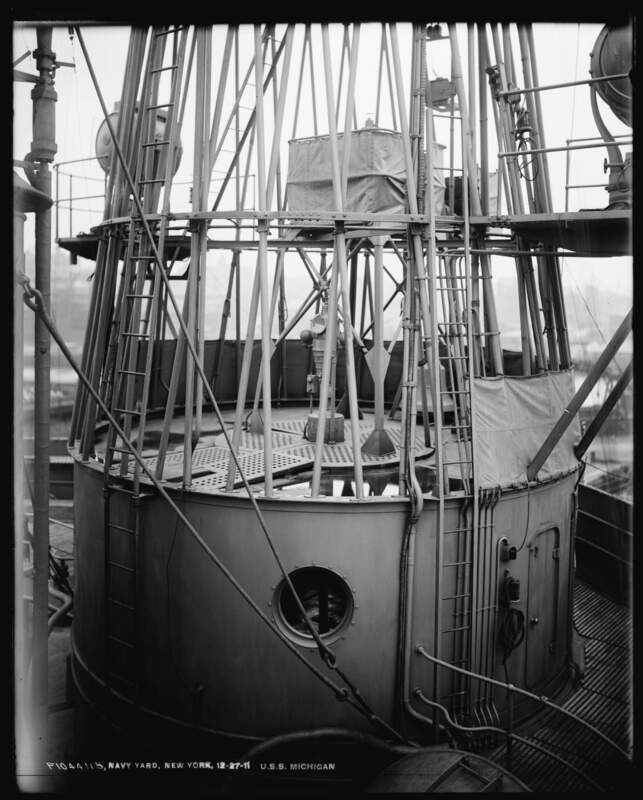 126k View looking aft from atop Turret # 2, showing Michigan's (BB-27) collapsed "cage" foremast, which had buckled in an Atlantic storm on 15 January 1918. Photographed at the Philadelphia Navy Yard, Pennsylvania, 28 January 1918. 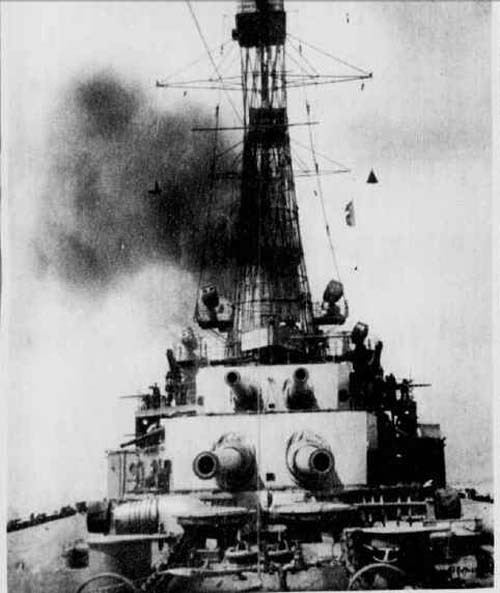 Note details of armored conning tower, and tripod-mounted rangefinder atop it. U.S. Naval Historical Center Photograph # NH 46283. 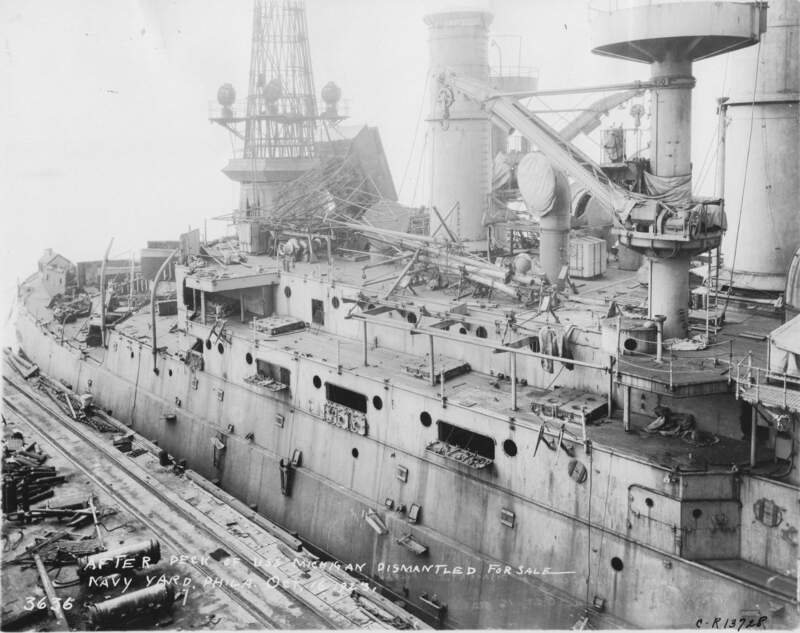 412k Michigan (BB-27) in port, soon after her "cage" foremast collapsed in an Atlantic storm on 15 January 1918. U.S. Naval Historical Center Photograph # NH 106440. The original photograph, given to Michigan (SSGN-727) by Mr. Sanford Aronoff, was donated by the ship to the Naval History and Heritage Command in 2008. 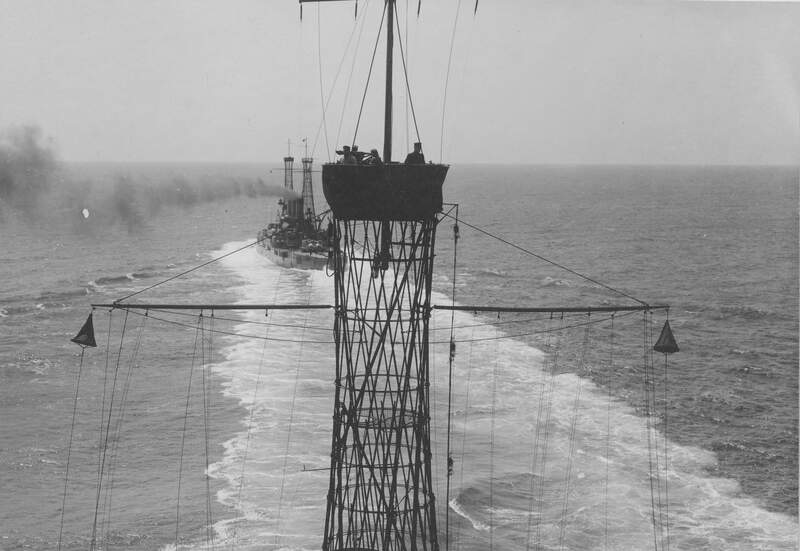 This great derrick, called "Hercules," is here seen lifting a steel mast at the plant of the Newport News Shipbuilding and Dry Dock Company. It is said to be one of the largest electrically operated revolving derricks in the world. The photograph, with others of a similar nature, appeared in The National Marine. Assuming this photograph wasn't aging in a camera somewhere, the mast most likely belongs to the Michigan (BB-27). The only other battleship built within a year of this date was the Mississippi (BB-41), which was commissioned 18 December 1917. Image and text provided by Library of Congress, Washington, DC. Photo from New-York Tribune. (New York [N.Y.]) 1866-1924, 14 April 1918, Image 43, courtesy of chroniclingamerica.loc.gov. 243k Looking forward from the main turrets. Photo courtesy of Scott Koen & ussnewyork.com. 77k Firing 12 inch guns aboard U.S. dreadnought Michigan (BB-27) at night. The white part is flame, the black gas, which disappears instantaneously. Photo by Enrique Mueller Jr.
Photo from New-York Tribune. (New York [N.Y.]) 1866-1924, 10 February 1918, Image 55, courtesy of chroniclingamerica.loc.gov. 2.2m "Four gun salvo at the instant of fire." Looking forward from the maintop of the Michigan (BB-27). The concussion of the guns at the moment of discharge released the shutter of the camera lens, thus producing this remarkable view of actual gunfire. USN photo # 22474-8-54 by Enrique Muller Jr, courtesy of Darryl L. Baker. 51k CAPT John Havens Dayton, #6, 20.06.1918 07.09.1918. Photo courtesy of the Library of Congress & submitted by Bill Gonyo. 367k Steam launches parked off her port side while at anchor with awnings over her rear turrets. USN photo courtesy of David Buell. 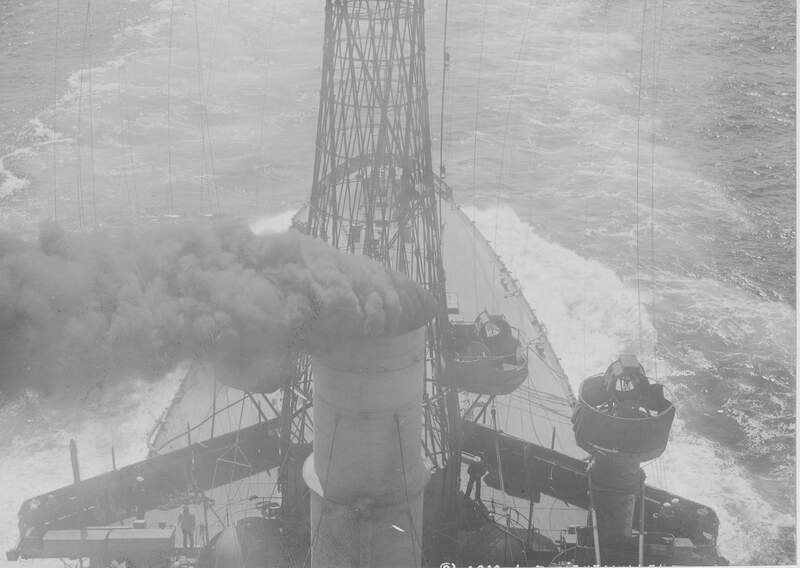 304k Underway, circa 1919. USN photo # 19-N-13358 from National Archives and Records Administration (NARA), College Park, Maryland, courtesy of Sean Hert. 377k A Navy wedding at League Island aboard the Michigan (BB-27). Image provided by: Penn State University Libraries; University Park, PA.
Photo from The Evening Public Ledger. (Philadelphia [Pa.]) 1914-1942, 27 May 1919, via chroniclingamerica.loc.gov. 298k Photo taken at Pearl Harbor and the Michigan (BB-27) and South Carolina (BB-26) are moored at 1010 dock. 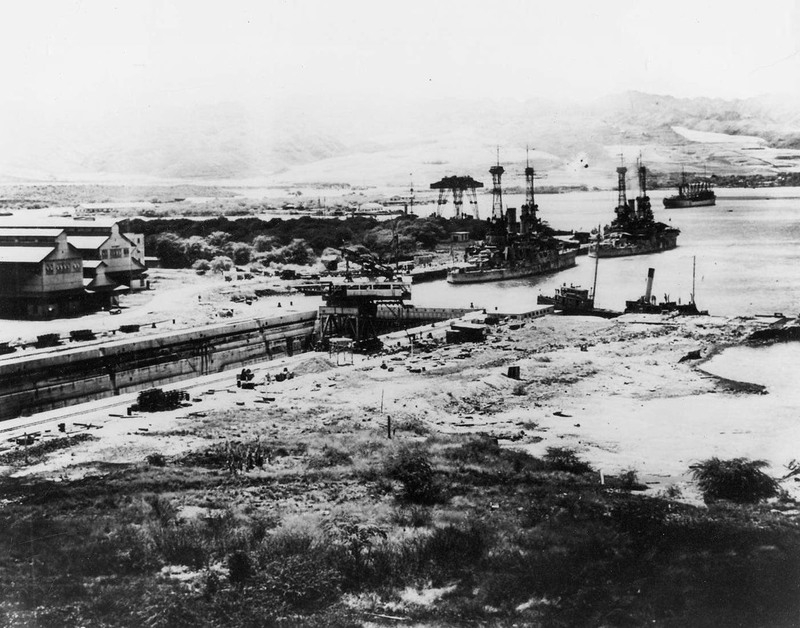 The dry dock is the newly constructed dry dock #1 and the shipyard buildings are visible to the extreme right. YD-25 is also visible in the center distance. Photo i.d. & text courtesy of Curtis Tammany. 1.33k Mirror image of the above. Photo courtesy of Curtis Tammany. 69k Philadelphia Navy Yard, Pennsylvania. 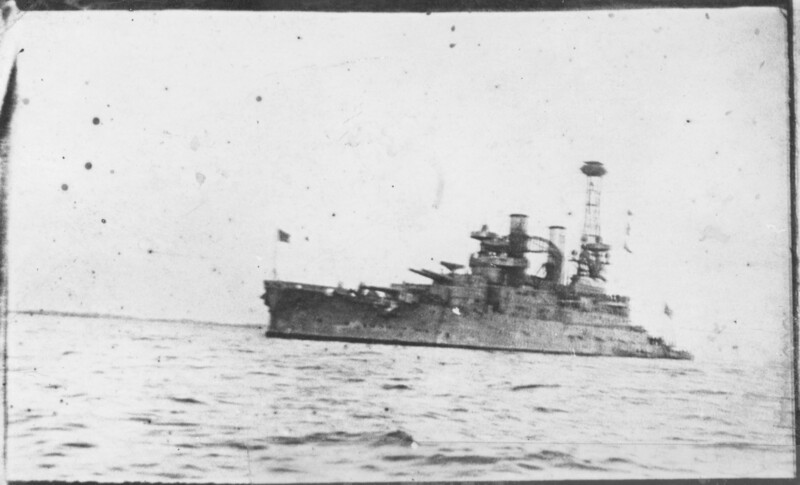 Older warships in the Reserve Basin, 18 November 1919, as seen by a Philadelphia Evening Ledger photographer. Ships are (front row, left to right): Missouri (BB-11); one Connecticut class battleship; Michigan (BB-27); and Saint Louis (C-20). Those in the back row are (left to right): Maine (BB-10); Kentucky (BB-6);Kearsarge (BB-5); Indiana (BB-1); Massachusetts (BB-2); Iowa (BB-4); Wisconsin (BB-9); and Illinois (BB-7). U.S. Naval Historical Center Photograph # NH 42525. 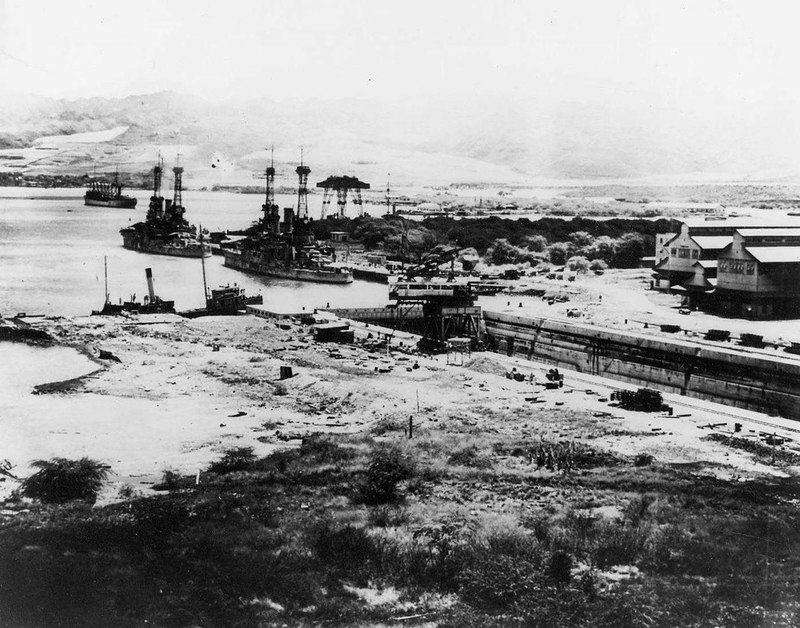 143k Entering Honolulu Harbor, Hawaii, "with the U.S. Fleet Second Observation Group," 7 March 1920 photo showing the ship in her final appearance. Range clocks and turret deflection scales have been added. Due to her short length superstructure, boats are carried amidships. Broadside 3" gun shutter doors are open here, but the guns have been removed. USN photo. 104k U. S. WARSHIPS CARRY QUEER MASCOTS TO KEEP UP THE "LUCK OF THE NAVY"
Every one of Uncle Sam's fighting ships has its mascot, and some of them are very queer indeed. Note the Panama sugar bear on the shoulder of the Jackie in the center. He is the mascot on the battleship Alabama (BB-8). The Michigan (BB-27) has - a bird mascot, a parakeet shown at the right. Goats are probably the commonest mascots. The one at the left is on the Kentucky (BB-6), and the one below entertains the sailors on the big battleship Wyoming (BB-32). Image and text provided by University of Tennessee.The News Scimitar. (Memphis, Tenn.) 1907-1926, 25 September 1920, 4TH EDITION, AUTO NUMBER, Image 26, courtesy of chroniclingamerica.loc.gov. 697k Removing gun from forward 12" turret; Lifting sling in place, Michigan (BB-27) PNY, 26 September 1923. US National Archives photo # 19LC-21-G-3632, from NARA, College Park, Maryland, courtesy of Sean Hert. 556k Hauling out gun from forward 12" turret; Lifting sling in place, Michigan (BB-27) PNY, 9 October 1923. 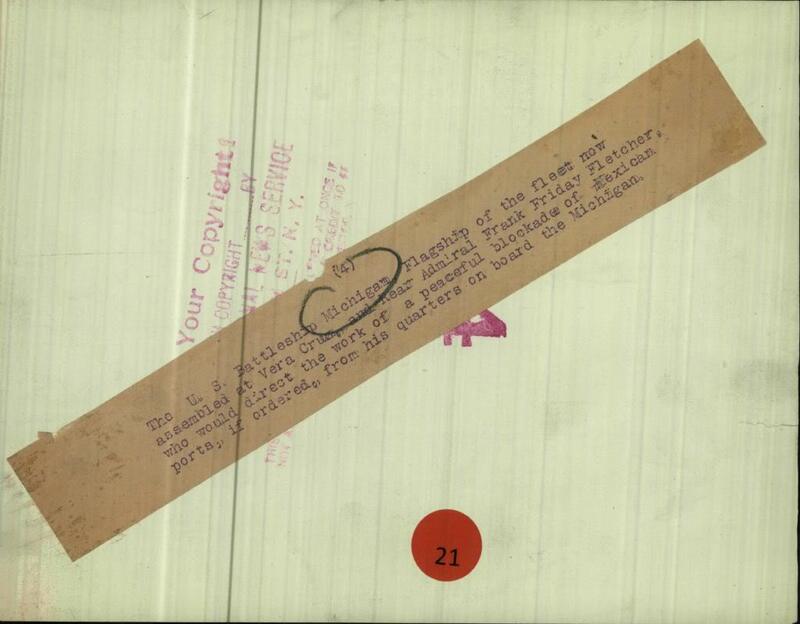 US National Archives photo # 19LC-21-G-3627, from NARA, College Park, Maryland, courtesy of Sean Hert. 608k Gun rotated ready for hauling out; forward 12" turret, Michigan (BB-27) PNY, 9 October 1923. US National Archives photo # 19LC-21-G-3630, from NARA, College Park, Maryland, courtesy of Sean Hert. 512k Broadside of Michigan (BB-27) dismantled for sale, PNY, 16 October 1923. 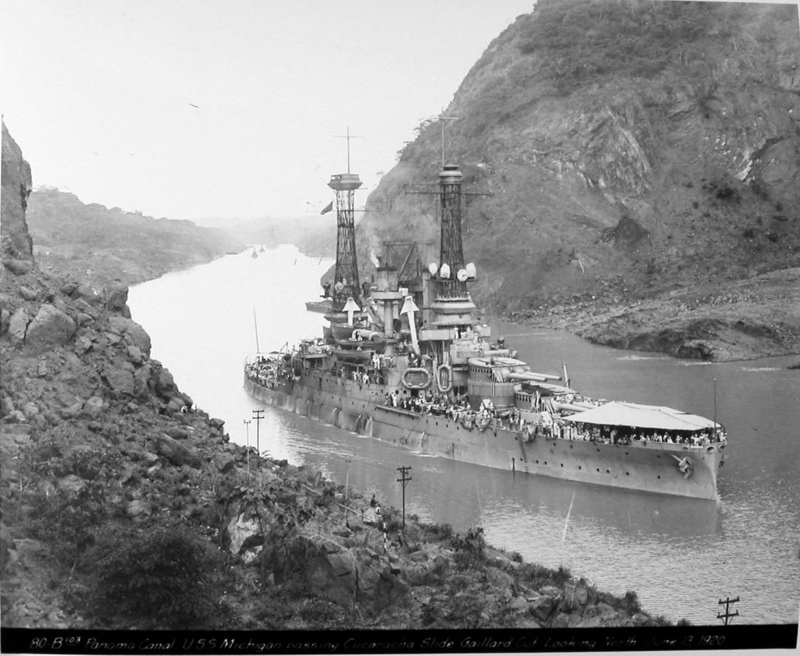 The battleship in the background is the South Carolina (BB-26). US National Archives photo # 19LC-21-G-3634, from NARA, College Park, Maryland, courtesy of Sean Hert. 768k Forward deck of Michigan (BB-27), dismantled for sale, PNY, 16 October 1923. US National Archives photo # 19LC-21-G-3635, from NARA, College Park, Maryland, courtesy of Sean Hert. 768k After deck of Michigan (BB-27), dismantled for sale, PNY, 16 October 1923. US National Archives photo # 19LC-21-G-3636, from NARA, College Park, Maryland, courtesy of Sean Hert. 746k Amidship of Michigan (BB-27), dismantled for sale, PNY, 26 October 1923. Details of her bridge and upper deck are clear. Note the small chart house at the base of her mast and the flimsiness of the weather protection around her flying bridge. 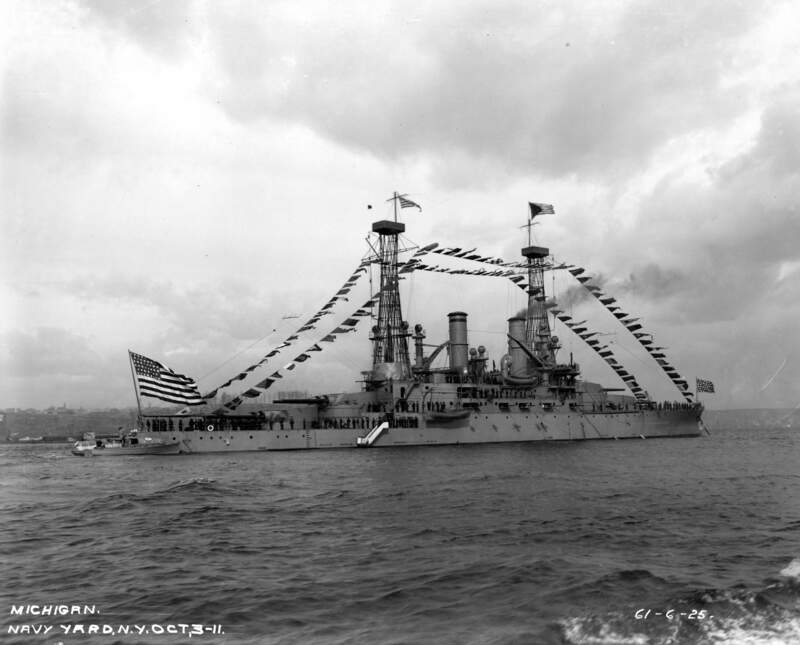 Many photos of this type were taken to prove the U.S. was complying in accordance with the Washington Naval Treaty. Text courtesy of U.S. Battleships: An Illustrated Design History by Norman Friedman. US National Archives photo # 19LC-21-G-3637, from NARA, College Park, Maryland, courtesy of Sean Hert. 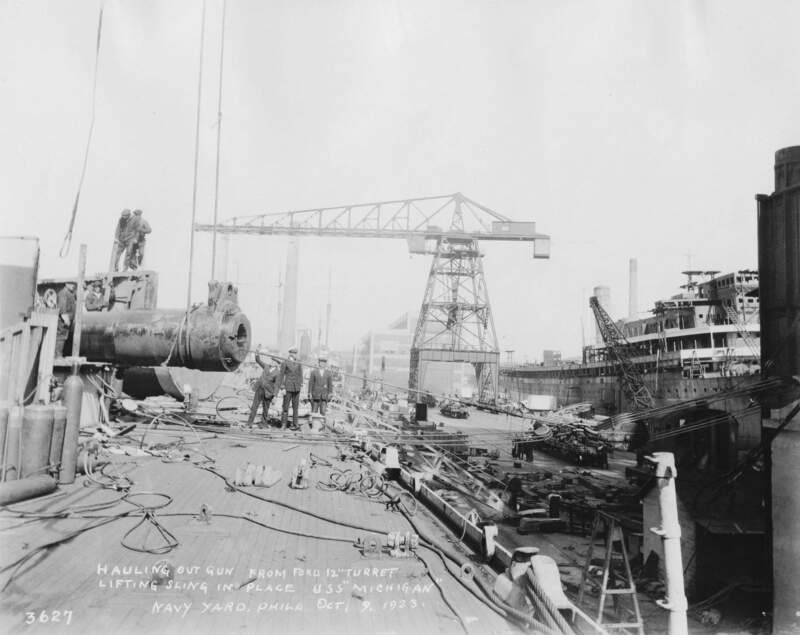 82k 5 January 1925 photo of the Michigan (BB-27) being scrapped at the Philadelphia Navy Yard in accordance with the Washington Naval Treaty. USN photo.